PfATG8 immunofluorescent staining in apicoplast-minus malaria parasites. The integrity of the apicoplast in these parasites was lost using treatment with the antibiotic chloramphenicol. GFP-ACP parasite cultures were rescued by supple-menting media with isopentenyl pyrophosphate (IPP), the essential product from the non-mevalonate isoprenoid precursor pathway in the apicoplast. 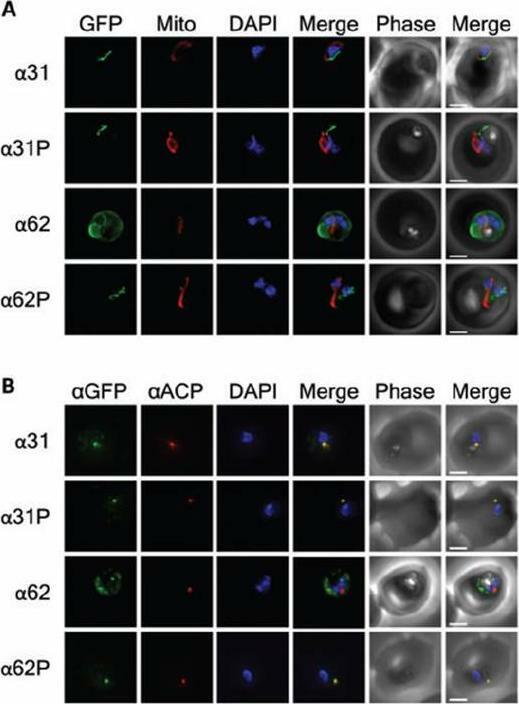 The large apicoplast PfATG8-labeled branching, as observed in untreated parasites, is disrupted into multiple foci in apicoplast-minus parasites. These foci show colocalization of GFP-ACP and PfATG8 vesicles, although additional PfATG8 vesicles can be observed in the cytosol. DAPI is used as a DNA marker in blue. Scale bar: 2.5 μmA.PfATG8 immunofluorescent staining in 3D7 parasites treated with lysosomotropic agents and artemisinin. After 3 h incubation with 75 nM of bafilomycin A1, branching of the apicoplast is disrupted and multiple PfATG8 autophagosomes can be observed. Artemisinin treatment at a high concentration (25 μM) results in cell cycle progression arrest, and chloroquine treatment, at a concentration of 100 nM (IC80), causes disruption of the apicoplast integrity. DAPI is used as a DNA marker in blue. Scale bar: 2.5 μm.Cervantes S, Bunnik EM, Saraf A, Conner CM, Escalante A, Sardiu ME, Ponts N, Prudhomme J, Florens L, Le Roch KG. The multifunctional autophagy pathway in the human malaria parasite, Plasmodium falciparum.. Autophagy. 2013 Nov 11;10(1). PfATG8 immunofluorescence staining throughout the erythrocytic cycle. 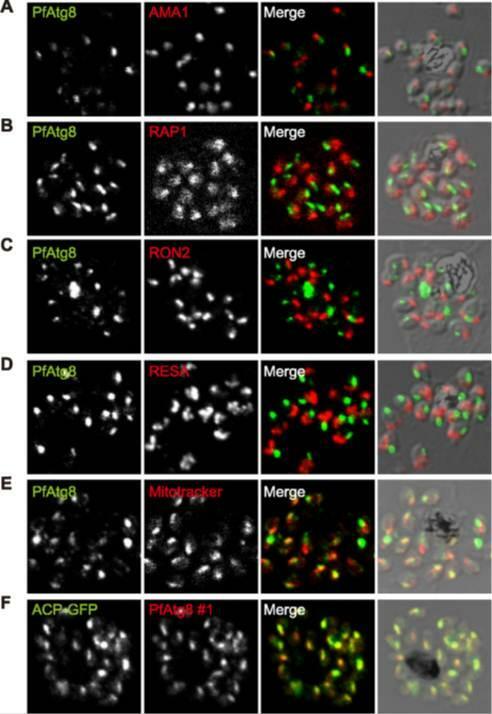 Tightly synchronized P. falciparum D10-ACP-GFP parasites were immunolabeled with anti-PfATG8. D10 parasites express ACP-GFP, an apicoplast signal and transit peptide fused to GFP that localizes to the apicoplast. 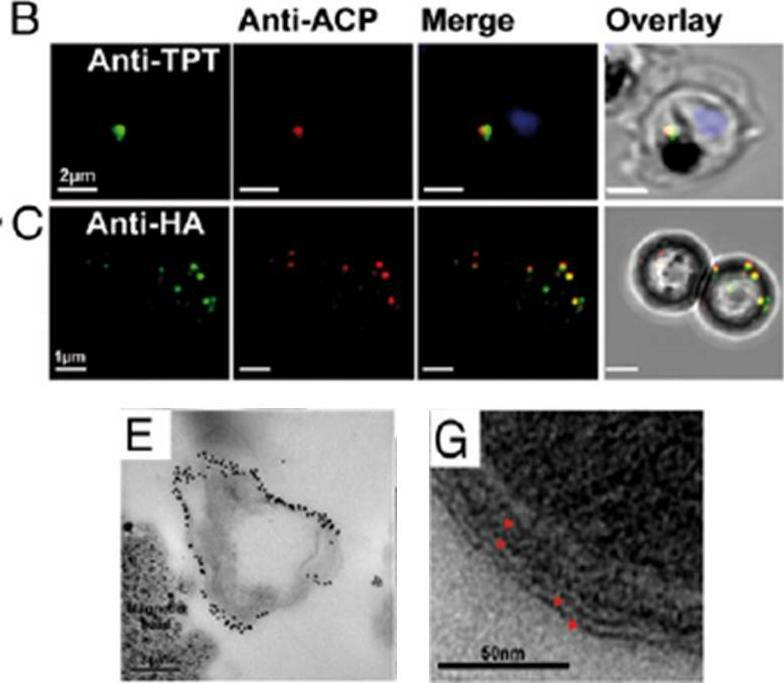 Localization of ACP-GFP and PfATG8 can be observed, although PfATG8 appears to surround the apicoplast, indicating a possible association with the outer membrane. 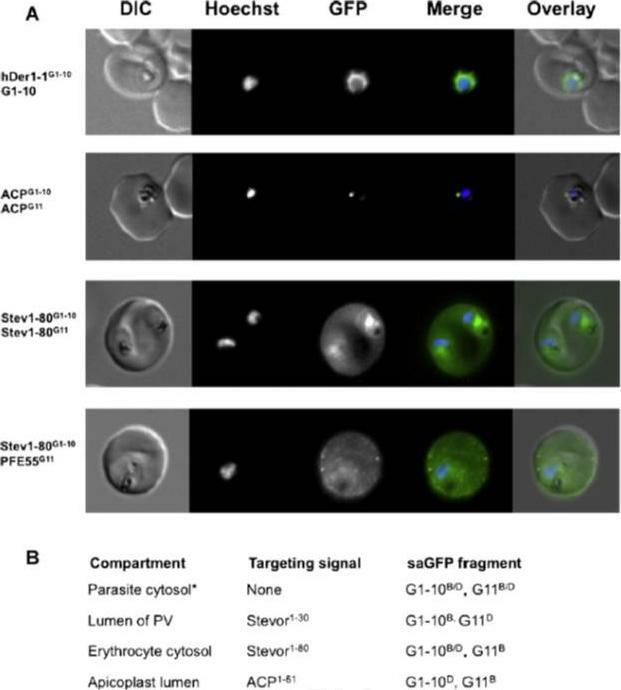 Additional PfATG8 vesicles can be observed in the cytosol and host red blood cell from the late ring to late trophozoite stage, when parasites are metabolically active. DAPI is used as a DNA marker in blue. Scale bar: 5 μm.Cervantes S, Bunnik EM, Saraf A, Conner CM, Escalante A, Sardiu ME, Ponts N,Prudhomme J, Florens L, Le Roch KG. 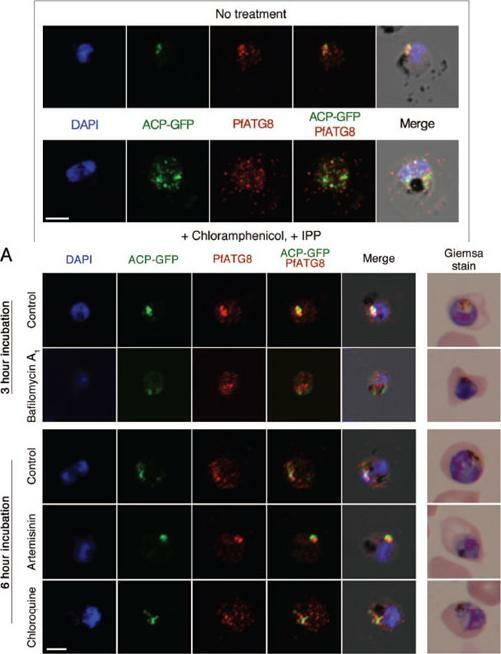 The multifunctional autophagy pathway in the human malaria parasite, Plasmodium falciparum.. Autophagy. 2013 Nov 11;10(1). PfAtg8 localizes to the apicoplast. P. falciparum FCR3 (A–E) and P. falciparum 3D7 transfected with ACP-GFP (F–H) were stained with the indicated organelle markers and visualized by confocal microscopy (because ACP-GFP was not uniformly expressed, some merozoites displayed only faint GFP signals). Anti-PfAtg8 antibody #1 was used in (A–F), and anti-PfAtg8 antibody #2 was used in (G). 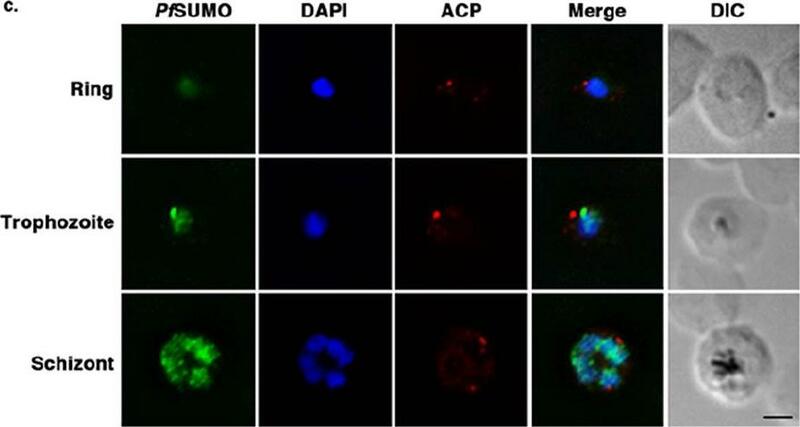 Apical membrane antigen 1 (AMA1) as a microneme marker (A), rhoptry-associated protein 1 (RAP1) as a rhoptry body marker (B), rhoptry neck protein 2 (RON2) as a rhoptry neck marker (C), the ring-infected erythrocyte surface antigen (RESA) as a dense granule marker (D), MitoTrackerRed CMXRos as a mitochondria marker (E), ACPGFP (F–H) and the organellar histone-like protein PfHU (H) as an apicoplast marker were used. 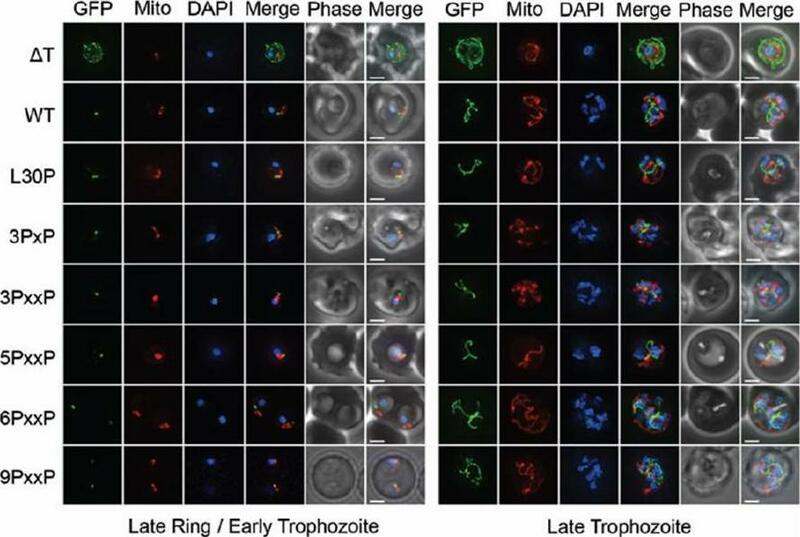 Scale bar, 1 mm.Kitamura K, Kishi-Itakura C, Tsuboi T, Sato S, Kita K, Ohta N, Mizushima N. Autophagy-Related Atg8 Localizes to the Apicoplast of the Human Malaria Parasite Plasmodium falciparum. PLoS One. 2012;7(8):e42977. Top - Apicoplast and mitochondrial morphology and association during schizogony in P. falciparum. Live citrate synthase-YFP and acyl carrier proten DsRed double transfectant cells were co-labelled with the nuclear dye Hoechst 33258. Apicoplast morphology was categorized into four sorts: (i) rounded (ii) elongated (iii) branched and (iv) divided. Results indicated that at the onset of schizogony, the apicoplast is predominantly elongated in form. By the 6–10 nucleus stage, branched apicoplasts are the predominant form, with the majority of apicoplasts divided by the >15 nucleus stage. Bottom - Mitochondrial morphology was categorized as (i and ii) elongated (iii) branched and (iv) divided. The mitochondrion is a dynamic organelle, whose predominant form throughout the asexual cycle was branched. Mitochondrial division occurs very late in schizogony. The mitochondrion appears capable of fusion (ii and iii) and frequently associates with the plasma membrane (ii, arrow).van Dooren GG, Marti M, Tonkin CJ, Stimmler LM, Cowman AF, McFadden GI. 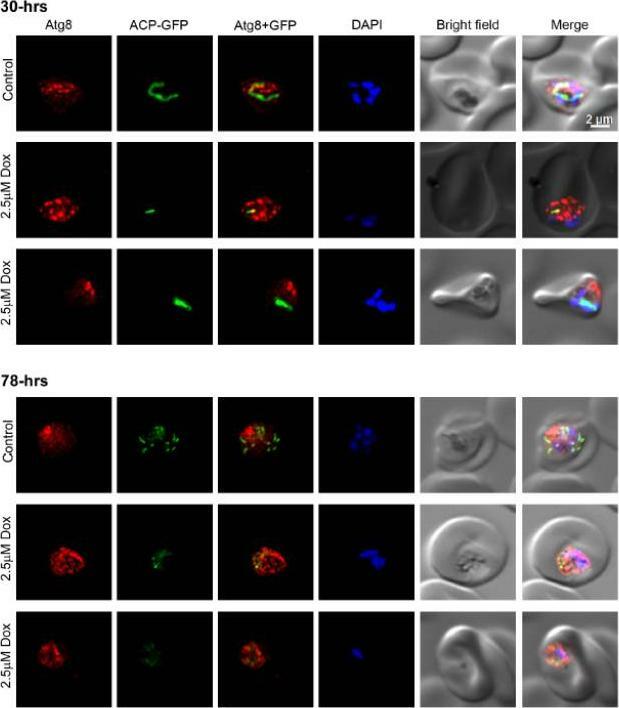 Development of the endoplasmic reticulum, mitochondrion and apicoplast during the asexual life cycle of Plasmodium falciparum. Mol Microbiol. 2005 57:405-19. Localisation of PfFtsH1 in a P. falciparum 3D7 transfectant line carrying C-terminal 3xHA-tagged PfFtsH1. (B) Immunofluorescence localization of PfFtsH1-HA using the anti-HA mAb and antibody against the apicoplast marker ACP. No overlap of PfFtsH1-HA signal was observed with the apicoplast marker. (C) PfFtsH1 co-localizes with the mitochondrial signal in trophozoites (upper panel) and appears as punctuate signals lining the organelle defined by the mitochondrial stain Mitotracker Red in schizonts (lower panel). (D) Confocal microscopy PfFtsH1-HA expressing parasites showing co-localisation of PfFtsH1 with the mitochondrion which is stained with Mitotracker Red. clear overlap was observed between the PfFtsH1-HA signal and the mitochondria-specific dye Mitotracker Red. When the mitochondria elongated and branched in the schizont stages, punctuate signals of PfFtsH1-HA were seen along the length of the organelle (C, lower panel).Tanveer A, Allen SM, Jackson KE, Charan M, Ralph SA, Habib S. An FtsH Protease Is Recruited to the Mitochondrion of Plasmodium falciparum. PLoS One. 2013 Sep 13;8(9):e74408. Cellular localization of HRD1. (A) HRD1 and plasmepsin V (PMV), an ER membrane marker, co-localize in P. falciparum. 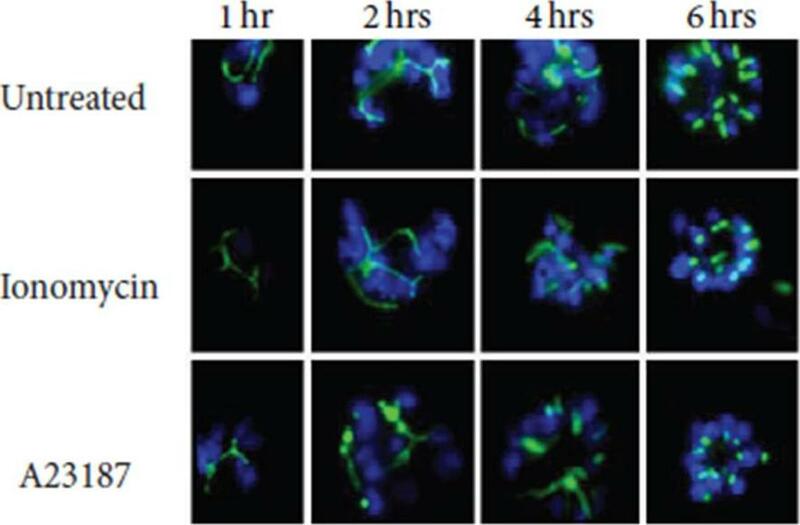 (B) At various stages of the parasite life cycle, HRD1 was co-stained with the nuclei (DAPI) and the apicoplast (ACP-GFP) in the P. falciparum strain D10. 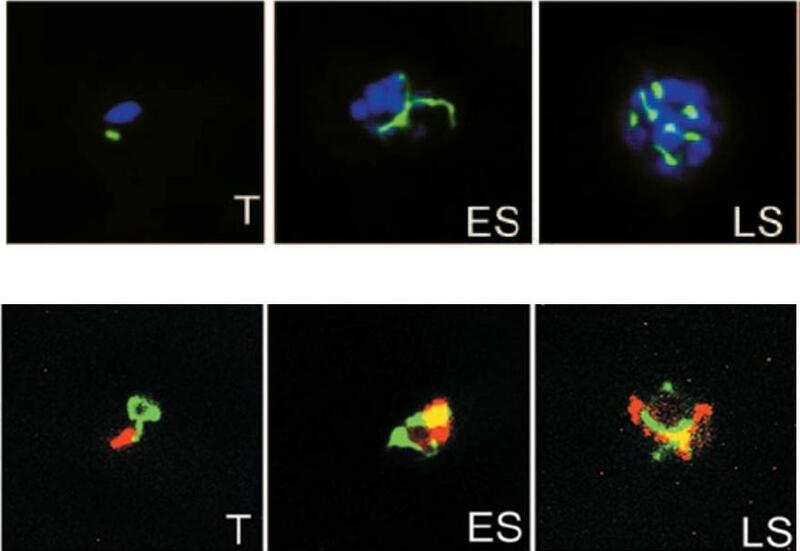 HRD1 was found within reticular structures outside the nuclear regions at the trophozoite and schizont stages of the parasite, similar to the physical attributes of the ER. In the late schizont stage HRD1 proteins reside within globular structures surrounding each budding merozoite in a pattern typical of the ER. These observations support that HRD1-E3 ubiquitin ligase resides in the ER membrane, consistent with a putative role in the ERAD pathway.Chung DW, Ponts N, Prudhomme J, Rodrigues EM, Le Roch KG. Characterization of the Ubiquitylating Components of the Human Malaria Parasite's Protein Degradation Pathway. PLoS One. 2012;7(8):e43477. Dissection of the dual localization of P. falciparum GR. (A) Dual localization (cytosol and apicoplast) of GR-N71-GFP effected by a newly discovered N-terminal extension/leader. (C) Cytosolic targeting of a construct lacking the signal peptide (GR-TP-GFP). (E) Apicoplast targeting of construct (A) after mutation of methionine 47 to alanine (GR-N71-GFP M47A). Kehr S, Sturm N, Rahlfs S, Przyborski JM, Becker K. Compartmentation of redox metabolism in malaria parasites. PLoS Pathog. 2010 6:e1001242. 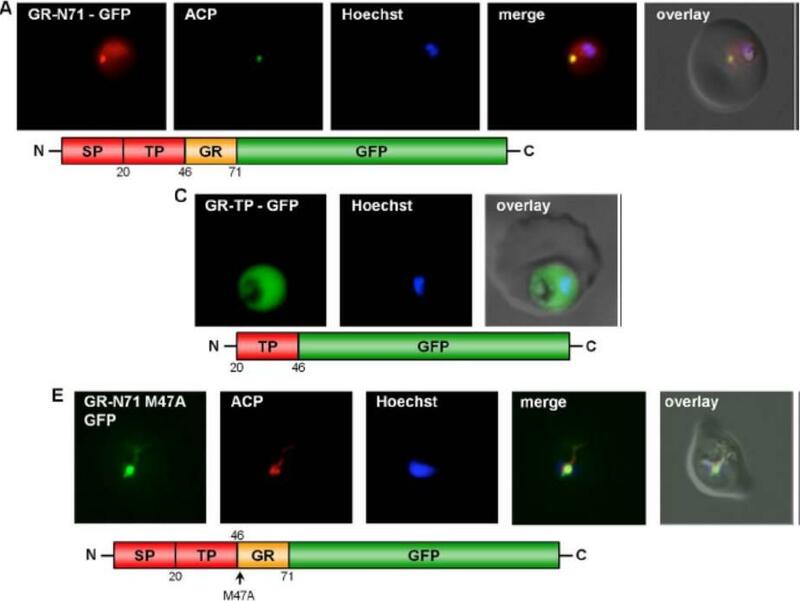 Immuno-localization of GFP chimeras in transgenic parasites. Formylmethionine deformylase PDF(f)-GFP co-localizes with anti-ACP (C and D), although it sometimes appears to localize within a sub-region of the ACP labelling (D).Tonkin CJ, van Dooren GG, Spurck TP, Struck NS, Good RT, Handman E, Cowman AF, McFadden GI. Localization of organellar proteins in Plasmodium falciparum using a novel set of transfection vectors and a new immunofluorescence fixation method. Mol Biochem Parasitol. 2004 137:13-21. Copyright Elsevier 2009. Confocal fluorescence microscopy images of transfected 3D7 P. falciparum-infected RBCs expressing a GFP chimera directed to the apicoplast. DIC image, the GFP fluorescence signal and an overlay of a P. falciparum acyl carrier protein-GFP transfectant. Scale bar = 5 µm. 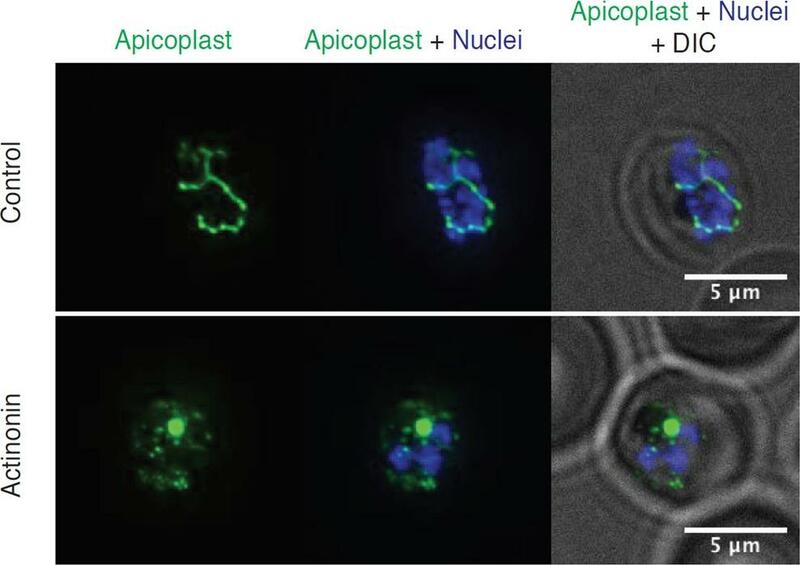 Apicoplasts are observed as small, rounded organelles (top row) in the ring stages that become elongated in the trophozoite stages (middle row) and forms contact points with the branched mitochondrion. The bottom row represents a schizont, where apicoplast division occurs. Apicoplast division occurs before mitochondrial division.Tilley L, McFadden G, Cowman A, Klonis N. Illuminating Plasmodium falciparum-infected red blood cells. Trends Parasitol. 2007 23:268-77. Copyright Elsevier 2009. Localization of GFP in the D10 ACPL-GFP strain was used to visualize the apicoplast. As expected, GFP localizes to a discrete structure in the parasite Widefield epifluorescence microscopy for apicoplast (ACPL-GFP) and nucleus (Hoescht 33342) comparing ring, trophozoite, and schizont.Yeh E, Derisi JL. 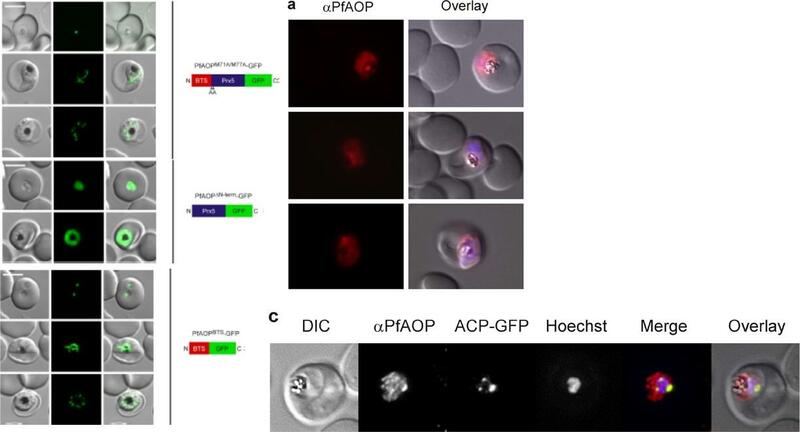 Chemical Rescue of Malaria Parasites Lacking an Apicoplast Defines Organelle Function in Blood-Stage Plasmodium falciparum. PLoS Biol. 2011 9(8):e1001138. Apicoplast division precedes mitochondrial division during schizogony. Acyl carrier protein (ACP) is an apicoplast marker. By mid-schizont stage, the majority of mitochondria are branched and the apicoplast also branches (A). Occasionally apicoplast branches appear to associate with mitochondrial branches (A arrows). The branched apicoplast always divides before the mitochondrion (B–D). Each segregated apicoplast closely associates with a branch of the mitochondrion (B–D). Fourth panel from the left in B shows a close-up of the boxed area in the third panel. Rarely, we observe apicoplasts not associated with a mitochondrial branch (arrow in C). The mitochondrion remains branched until apparently quite late in schizogony. Upon division, each mitochondrion associates with a divided apicoplast, and this organellar pair segregates into a single daughter merozoite. Arrow in E shows a mitochondrion associated with two apicoplasts. Presumably, this mitochondrion is still in the process of division.van Dooren GG, Marti M, Tonkin CJ, Stimmler LM, Cowman AF, McFadden GI. 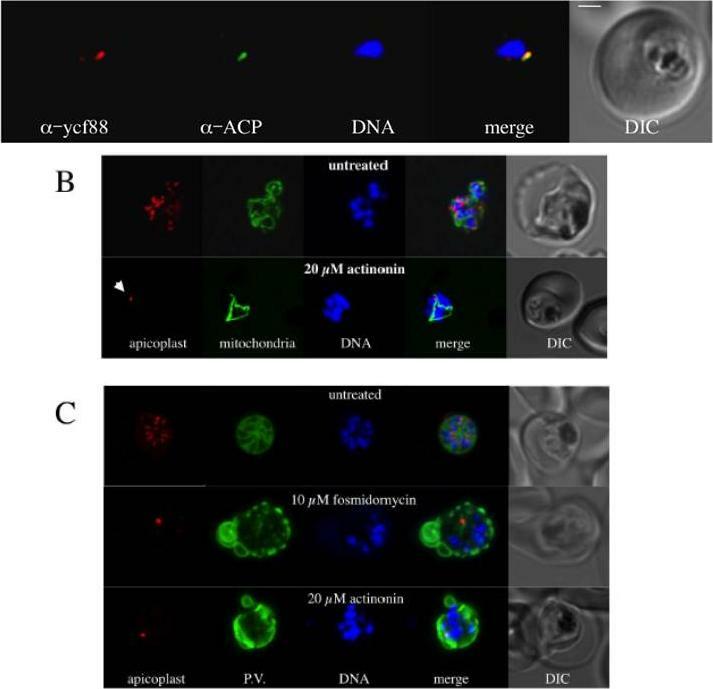 Development of the endoplasmic reticulum, mitochondrion and apicoplast during the asexual life cycle of Plasmodium falciparum. Mol Microbiol. 2005 57:405-19. Plasmodium falciparum expressing ACPtransit-GFP (A-D) and ACPsignal-GFP (E-H). ACPtransit-GFP expression results in cytoplasmic GFP in merozoites (A) through to schizonts (D). GFP is apparently excluded from the food vacuole (B, C) and other organelles. 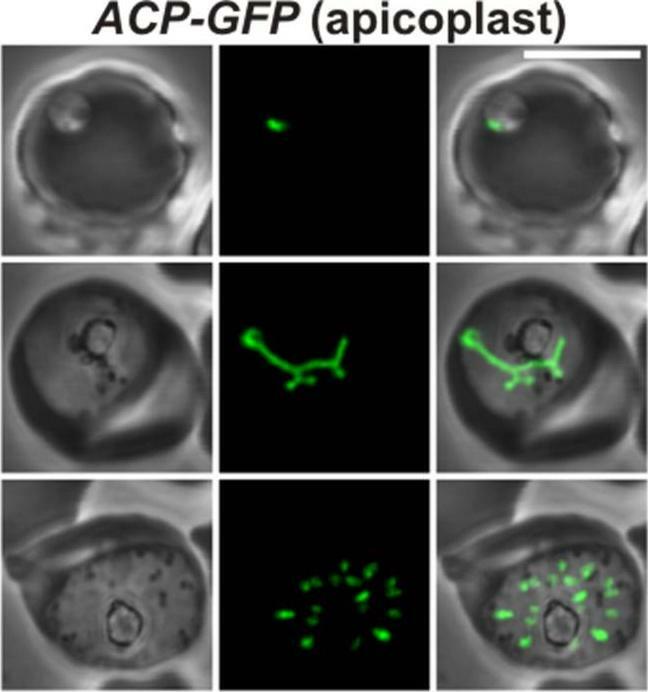 ACPsignal-GFP expression results in in GFP export to the parasitophorous vacuolar space. 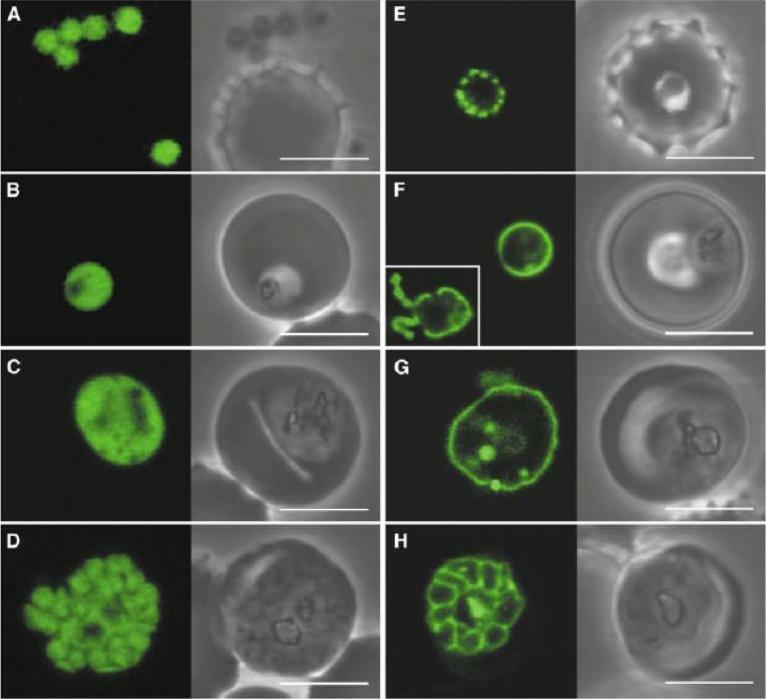 Newly invaded ring parasites (E) show punctuate fluorescence in the parasitophorous vacuole which may indicate some early formative stage of this specialized structure. Subsequent stages show continuous fluorescence surrounding the parasite (F, G) which ultimately delineates the products of schiziogony (H). GFP is also seen in the tubulovesicular network [(F), inset]. Some internalized GFP probably represents protein that re-enters the parasite in food vacuoles. Scale bar 5 mm.Waller RF, Reed MB, Cowman AF, McFadden GI. Protein trafficking to the plastid of Plasmodium falciparum is via the secretory pathway. EMBO J. 2000 19:1794-802. The relationship between the apicoplast and the mitochondrion throughout the intraerythrocytic cycle. The apicoplast remains round- or ovoid-shaped from the merozoite stage (A) into ring (B) and trophozoite stages (C), whereas the mitochondrion appears as a rod-shaped organelle (A–C). By early schizogony, the mitochondrion is predominantly branched and the apicoplast elongated (D–F). The second panel from the right in D shows a single optical section of the merged image, showing a single point of contact between the two organelles (arrow). Such points of connection are also apparent in E (two points of contact; arrows) and F (two points of contact: arrows). The mitochondrion frequently associates with the plasma membrane (arrows in E, right panel). Citrate synthase (CS) is a mitochondrial marker. Acyl carrier protein (ACP) is an apicoplast marker.van Dooren GG, Marti M, Tonkin CJ, Stimmler LM, Cowman AF, McFadden GI. 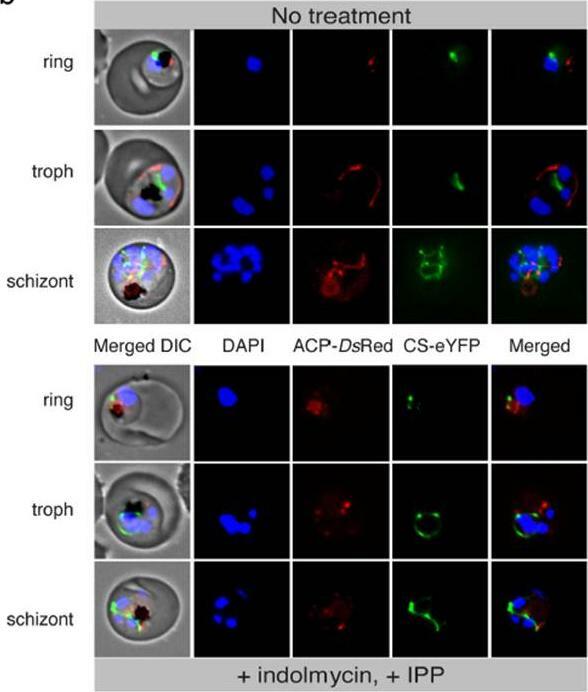 Development of the endoplasmic reticulum, mitochondrion and apicoplast during the asexual life cycle of Plasmodium falciparum. Mol Microbiol. 2005 57:405-19. 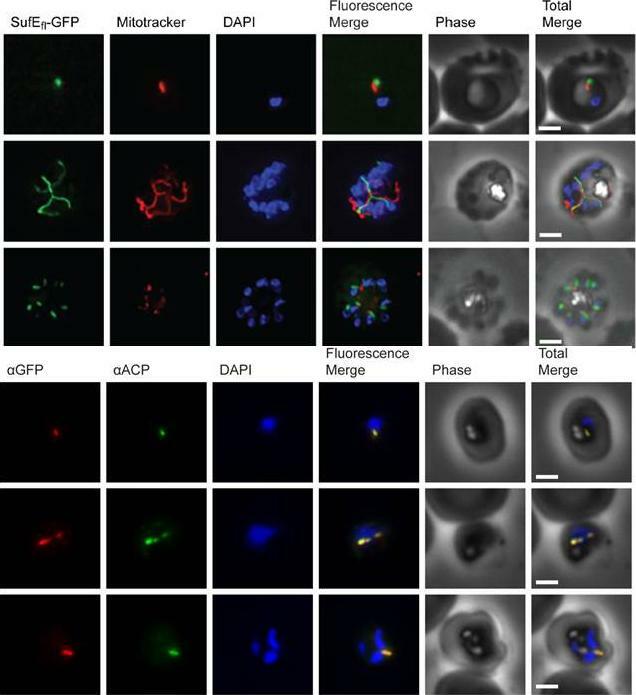 Plasmodium endosymbiotic organelles were visualised using double-transfected parasites with red fluorescent protein-labelled apicoplasts and yellow fluorescent protein-labeled mitochondria (D10 acyl carrier protein-RFP, citrate synthetase-YFP). In the schizont stage both the apicoplast and mitochondria elongate, branch and divide to segregate into daughter merozoites. Jackson KE, Pham JS, Kwek M, De Silva NS, Allen SM, Goodman CD, McFadden GI, Ribas de Pouplana L, Ralph SA. Dual targeting of aminoacyl-tRNA synthetases to the apicoplast and cytosol in Plasmodium falciparum. Int J Parasitol. 2012 42:177-86. PMID: . 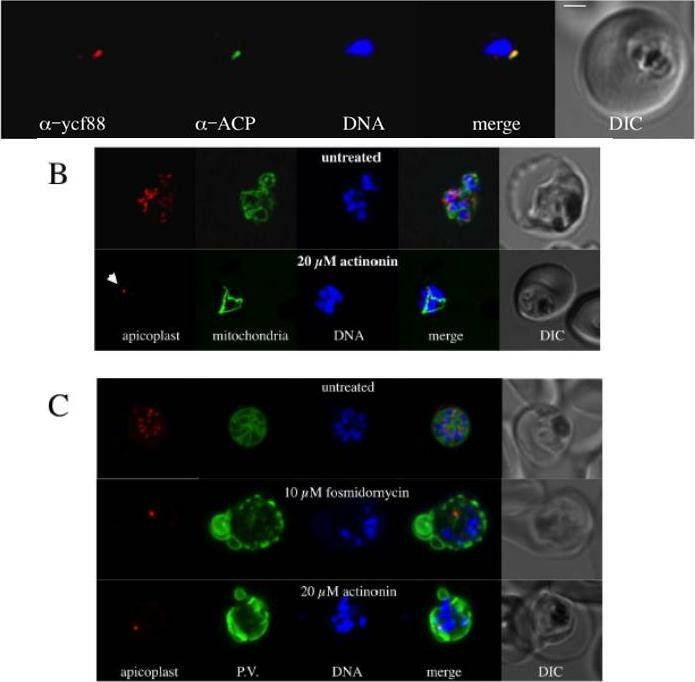 Localization of Pfstomatin to the apical organelles of merozoites and association of parasite rhoptry protein RhopH2 . Indirect immunofluorescence assays of: (i–iii) free merozoites probed with antibodies to Pfstomatin (i; green), and Mito Tracker (ii; red); the relative lack of co-localization of these markers is shown in the merged panel iii. iv–vi intracellular schizont-stage parasites expressing GFP in the apicoplast were probed with antibodies to Pfstomatin (iv; red), GFP (v; green); the relative lack of co-localization of these markers is shown in the merged panel vi. vii–ix free merozoites probed with antibodies to: Pfstomatin (vii; green), RhopH2 (viii; red); the extent of co-localization is shown in the merged panel ix. All images shown are single optical sections. The nucleus (blue) was stained with Hoechst 33342. 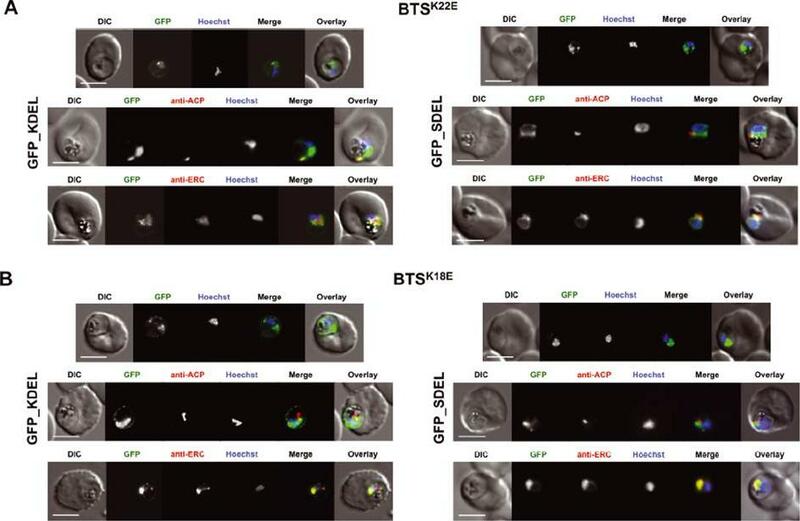 Scale bars correspond to 2 mm.Hiller NL, Akompong T, Morrow JS, Holder AA, Haldar K. Identification of a stomatin orthologue in vacuoles induced in human erythrocytes by malaria parasites. 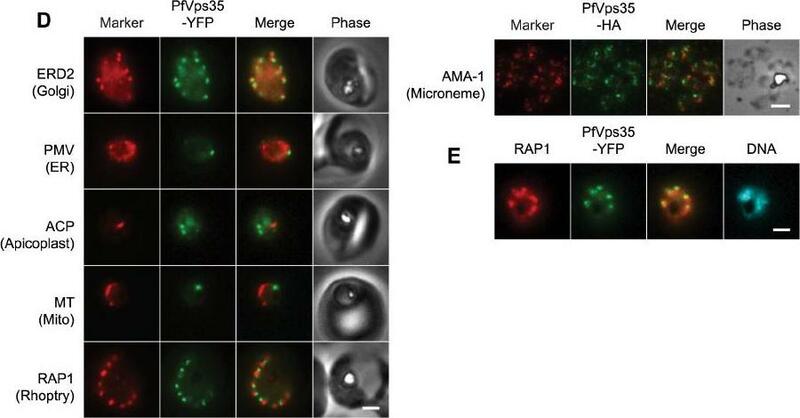 A role for microbial raft proteins in apicomplexan vacuole biogenesis. J Biol Chem. 2003 278:48413-21. Localization of Pfstomatin and RhopH2 to the PVM in ring-infected erythrocytes (0–8 h post-invasion). Cells were subjected to a standard indirect immunofluorescence assay where samples were permeabilized with saponin and probed with antibodies to: Pfstomatin (Ai; green), RhopH2 (Bi; green), and the PVM marker EXP-1 (Aii and Bii; red); the merged images are shown in Aiii and Biii. In C and D, ring-infected erythrocytes were treated with tetanolysin and incubated with antibodies to: Pfstomatin (Ci; red), RhopH2 (Di; red) and the PPM marker MSP-1 (Cii and Dii; green); the merged images are shown in Ciii and Diii. 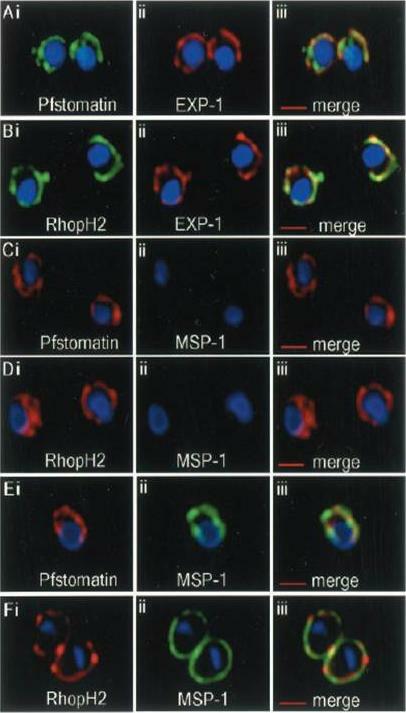 In E and F, rings treated with tetanolysin and permeabilized with saponin were incubated with antibodies to: Pfstomatin (Ei; red), RhopH2 (Fi; red), and MSP-1 (Eii and Fii; green); the merged images are shown in Diii and Fiii. All images shown are single optical section. The nucleus (blue) was stained with Hoechst 33342. Scale bars represent 2 mm. Hiller NL, Akompong T, Morrow JS, Holder AA, Haldar K. Identification of a stomatin orthologue in vacuoles induced in human erythrocytes by malaria parasites. 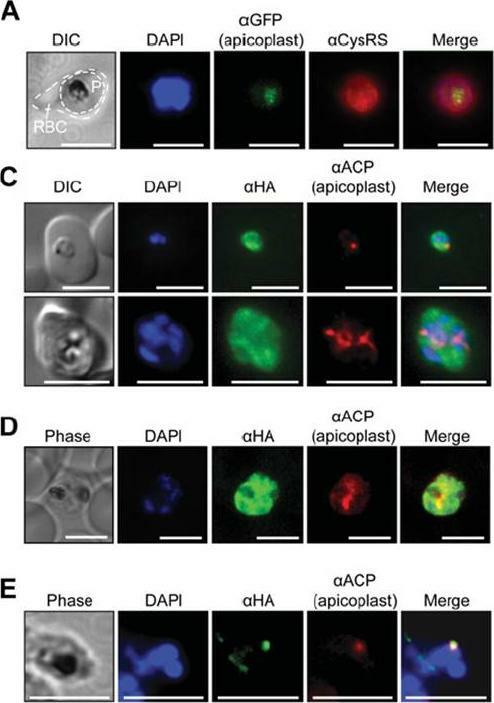 A role for microbial raft proteins in apicomplexan vacuole biogenesis. J Biol Chem. 2003 278:48413-21. Immunofluorescence assays for localization of PfRRF2.A. Live cell imaging of the PfRRF2leader–GFP transfectant with MitoTracker indicates predominantly mitochondrial targeting of PfRRF2. C. Immunofluorescence localization using anti-GFP Ab and MitoTracker shows colocalization of the PfRRF2leader–GFP signal with mitochondrion.D. 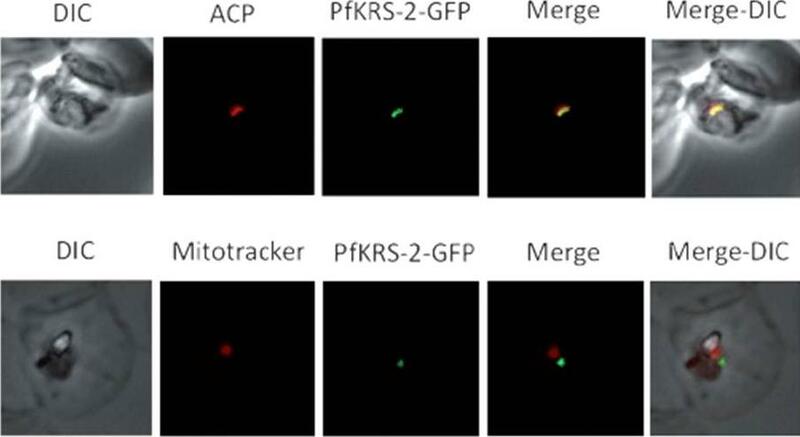 Absence of overlap between the apicoplast marker ACP and PfRRF2leader–GFP indicating that the PfRRF2 leader does not target the protein to the apicoplast. E. Immunofluorescence localization of PfRRF2 in P. falciparum 3D7-infected erythrocytes using rabbit anti-RRF2 antibody as probe. Cellswere stained with MitoTracker prior to fixation. F. P. falciparum D10 ACPleader–GFP infected erythrocytes were probed with anti-GFP and anti-RRF2 Abs. 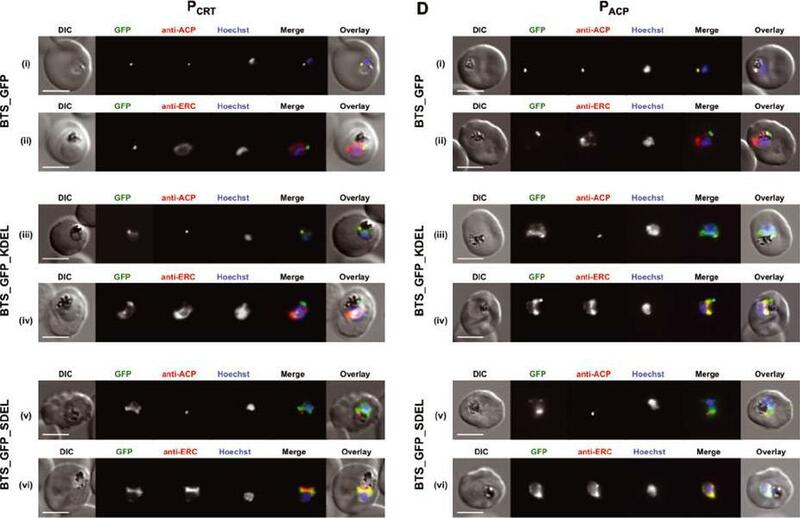 PfRRF2 signal did not overlap with the apicoplast.Gupta A, Mir SS, Jackson KE, Lim EE, Shah P, Sinha A, Siddiqi MI, Ralph SA,Habib S. Recycling factors for ribosome disassembly in the apicoplast andmitochondrion of Plasmodium falciparum. Mol Microbiol. 2013 88(5):891-905 . (A) Live cell imaging of co-transfectants expressing saGFP (self-assembling split GFP) fragments in various cellular compartments. In merge and overlay: green, GFP; blue, Hoechst. (B) Vectors available for analysis of cellular compartmentalisation using saGFP. Numbers in targeting sequence refer to N-terminal amino acids. B, Blasticidin-S-deaminase resistance cassette; D, hDHFR resistance cassette. *Can be used to generate fusions as multiple cloning sites situated in front of saGFP coding sequence. Külzer S, Petersen W, Baser A, Mandel K, Przyborski JM. 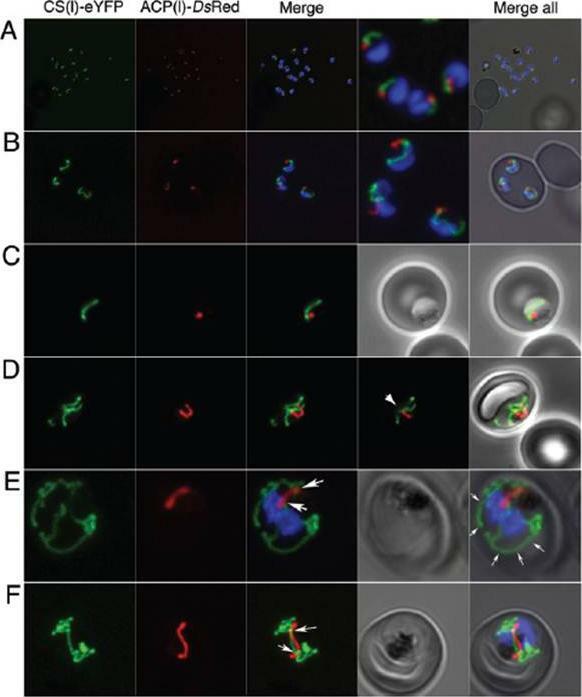 Use of self-assembling GFP to determine protein topology and compartmentalisation in the Plasmodium falciparum-infected erythrocyte. Mol Biochem Parasitol. 2012 187(2):87-90. Colocalization of GFP-2xFYVE with the apicoplast. This construct has been used in various organisms to monitor the intracellular localization of PI3P. 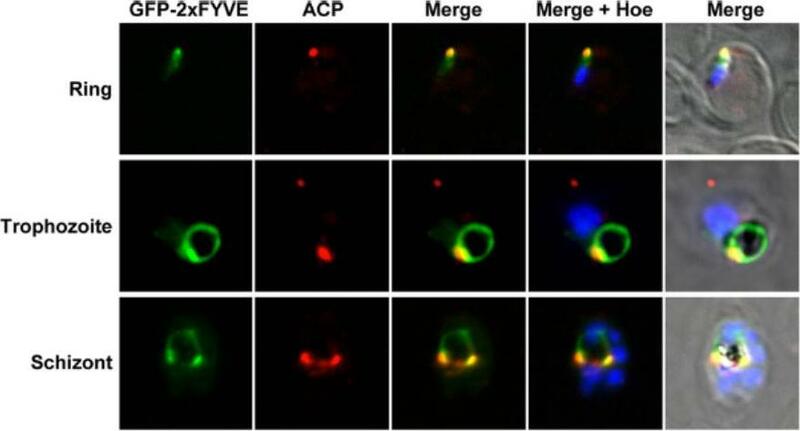 GFP-2xFYVE expressing parasites at the indicated developmental stages were incubated with rabbit anti-ACP (acyl carrier protein) as an apicoplast marker. Nuclei were stained with Hoechst stain (Hoe). 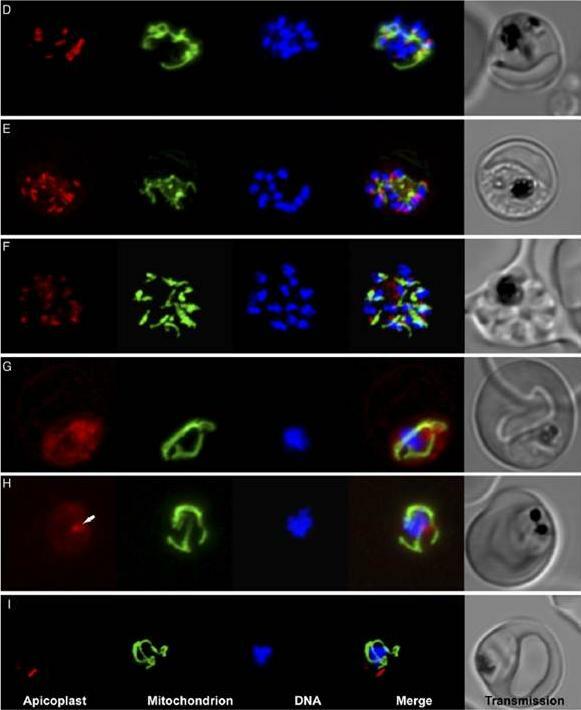 Fluorescence was associated with the apicoplast.Tawk L, Chicanne G, Dubremetz JF, Richard V, Payrastre B, Vial HJ, Roy C, Wengelnik K. Phosphatidylinositol 3-phosphate, an essential lipid in Plasmodium, localizes to the food vacuole membrane and the apicoplast. Eukaryot Cell. 2010 9:1519-30. PfTic22-HA is localized to the periphery of the apicoplast. (A) Confocal image of chemically fixed PfTic22-HA-carrying parasites labelled with anti-HA (green) and anti-ACP antibodies (red), showing that PfTic22-HA is associated with ACP (merge), but is localized to the periphery. Scale bars denote 1 mm, and inset shows a 3.3x zoom. (B) More examples of peripheral localization, similar to the inset above. Scale bar shows 0.5 mm. (C) Colocalisation of the GFP fluorescence from the PfTic22leader/GFP chimera and with anti-ACP, which does not exhibit a peripheral distribution. Scale bar is 1 μm.Kalanon M, Tonkin CJ, McFadden GI. 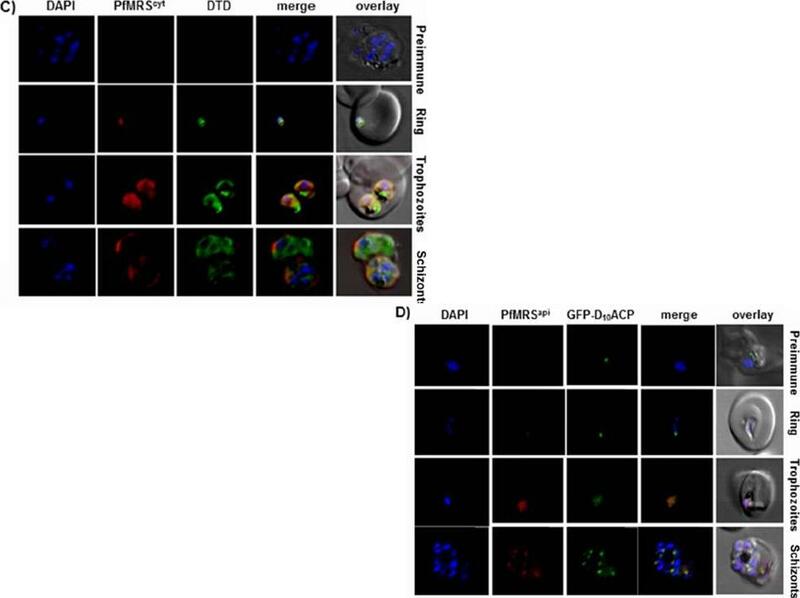 Characterisation of two putative protein translocation components in the apicoplast of Plasmodium falciparum. Eukaryot Cell. 2009 8(8):1146-54. 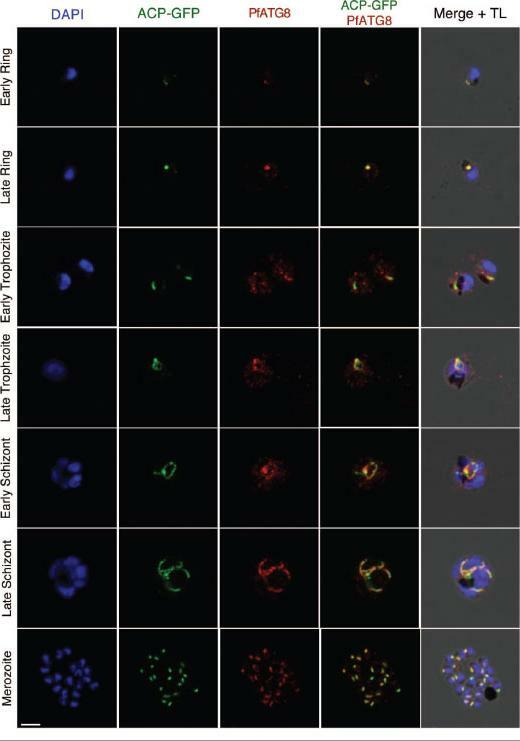 Localization of GloI, cGloII and tGloII GFP-fusion constructs in infectederythrocytes. (A) Live cell imaging of erythrocytes infected with transgenic parasite lines 3D7GloIG (upper panels) and 3D7cGloIIG (lower panels). GFP fluorescence was evident only within the body of the parasite (excluding the food vacuole). (B) Live cell imaging of erythrocytes infected with 3D7tGloIIG (apicoplast). 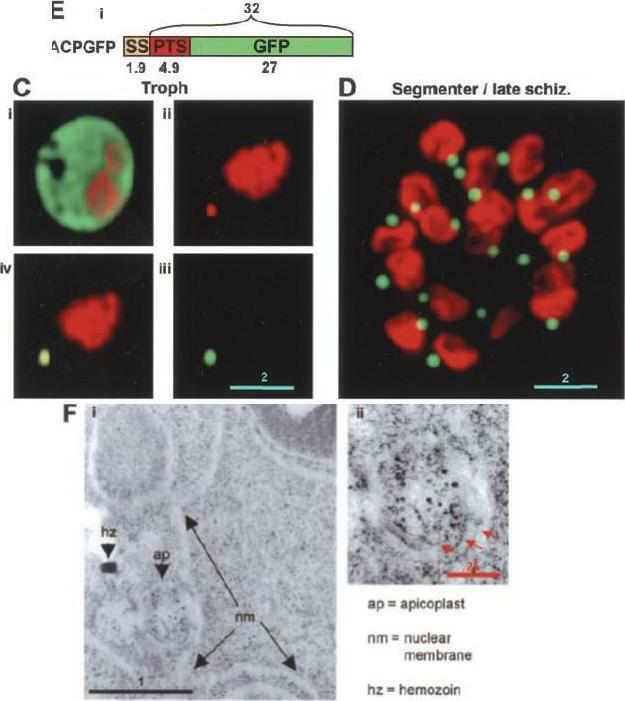 A distinct fluorescent “dot” was seen in both trophozoite (upper panel) and merozoite (lower panel) stage parasites, indicative of an apicoplast localization. The white arrow shows additional low levels in the arasitophorous vacuole. (C) Colocalization of tGloIIGFP and the apicoplast marker ACP in fixed, immunodecorated cells. 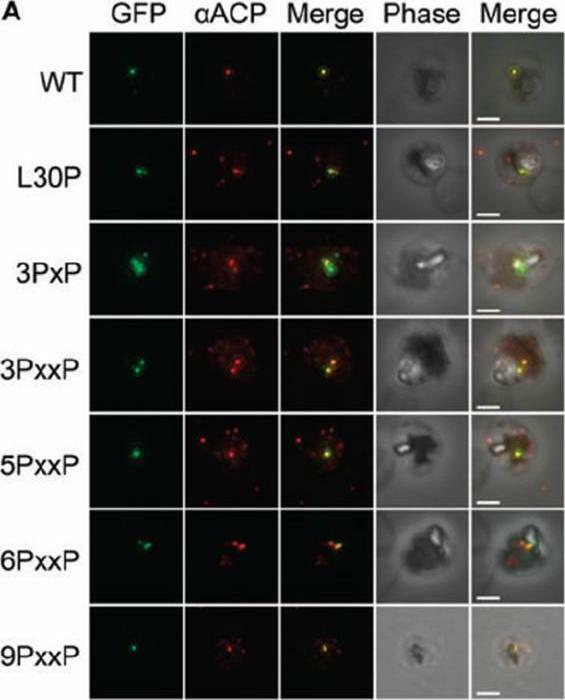 Note the high degree of overlap between tGloII-GFP and ACP.Urscher M, Przyborski JM, Imoto M, Deponte M. Distinct subcellular localization in the cytosol and apicoplast, unexpected dimerization and inhibition of Plasmodium falciparum glyoxalases. Mol Microbiol. 2010 76:92-103. Copyright John Wiley & Sons Ltd. 2010. Localization of PfACP in the apicoplast. An immuno-fluorescence assay was performed using anti-PfACP primary antibodies and fluorescein isothiocyanate (FITC)-conjugated secondary antibodies on glass slides containing thin smears of nonsynchronized P. falciparum parasites. E. Panels 1 and 2 show that PfACP (green) is localized to the apicoplast. DAPI was used to stain the nuclei. (F) Apicoplast localization of PfGyrA and PfGyrB. An immunofluorescence assay was performed using the above-described antibodies on glass slides containing thin smears of P. falciparum parasites (mostly late trophozoite stages). In panels 1and 2, PfACP (green) and PfGyrB (red) are colocalized to the apicoplast. In the third and fourth panels, PfGyrA (green) and PfGyrB (red) show colocalization to the apicoplast.Dar MA, Sharma A, Mondal N, Dhar SK. Molecular cloning of apicoplast-targeted Plasmodium falciparum DNA gyrase genes: unique intrinsic ATPase activity and ATP-independent dimerization of PfGyrB subunit. Eukaryot Cell. 2007 6(3):398-412. Localization studies of UBA (E1) and UBC (E2). (A,B) IFA experiments, using different parasite stages, show that PfUBA1 and PfUBC localize mainly to the cytosol. (C) When co-immunostained with plasmepsin V (PMV), a Plasmodium ER membrane protein marker, there was noticeable overlap between the two proteins, suggesting UBA1 recruitment to the ER as well. Both UBC and UBA1 are mainly dispersed throughout the cytoplasm with small aggregations scattered throughout the parasite. UBA1 was co-immuno-stained with PMV, an ER membrane marker, showing noticeable overlap between the two proteins.Chung DW, Ponts N, Prudhomme J, Rodrigues EM, Le Roch KG. Characterization of the Ubiquitylating Components of the Human Malaria Parasite's Protein Degradation Pathway. PLoS One. 2012;7(8):e43477. (D) Co-localization of PfVps35-YFP or PfVps35-HA and organellar markers in fixed parasites (except for MitoTracker, which was imaged live). PMV, plasmepsin V; ACP, acyl carrier protein; MT, MitoTracker Red CM-H2Xros; RAP1, rhoptry associated protein 1; AMA1, apical membrane antigen 1. The AMA1 panel shows free merozoites; all others are intraerythrocytic. Organelles labeled by the markers are indicated in parenthesis. Marker-derived fluorescence is pseudocolored red. (E) PfVps35-YFP is adjacent to developing rhoptries in a 2N parasite. Hoechst 33342 fluorescence (DNA) is pseudocolored cyan. In all panels, YFP fluorescence is pseudocolored green. Scale bars, 2 mm.Krai P, Dalal S, Klemba M. Evidence for a Golgi-to-Endosome Protein Sorting Pathway in Plasmodium falciparum. PLoS One. 2014 9(2):e89771. Localization in the apicoplast of an antigen recognised by PfYcf93 peptide antisera. PfYcf93 (red) localises to a small punctum that overlaps with the apicoplast marker acyl carrier protein (green) and sits beside the nucleus (blue) in a small, ring-stage parasite within a red blood cell. Bar = 1 mm. B. Effect of the putative post-translational inhibitor actinonin on biogenesis of the apicoplast, mitochondria and nuclei. Live cell imaging of untreated parasite with red fluorescent apicoplast, green fluorescent mitochondrion and blue fluorescent nuclei shows the normal branching/division of the apicoplast, elaboration of the mitochondrion and multiplication of the nucleus at the schizont stage. Actinonin-treated parasite at the same stage shows abranched mitochondrion and multiple nuclei but an undeveloped, stunted apicoplast (arrow). C) Effect of fosmidomycin and actinonin on the apicoplast and parasitophorous vacuole (P.V.) at the schizont stage. Immunofluorescence assay of untreated parasite with red fluorescent apicoplast (anti-ACP), green P.V. and blue fluorescent nuclei shows the segregation of the apicoplast, nuclei into distinct merozoites during late schizont stage. Actinonin or fosmidomycin treated parasites at the same stage show multiple nuclei but an undeveloped apicoplast and severe disruption of internal membrane structure in the parasite.Goodman CD, McFadden GI. Ycf93 (Orf105), a Small Apicoplast-Encoded Membrane Protein in the Relict Plastid of the Malaria Parasite Plasmodium falciparum That Is Conserved in Apicomplexa. PLoS One. 2014 Apr 4;9(4):e91178. Apicoplast development and DNA replication are hardly inhibited by calcium ionophores. 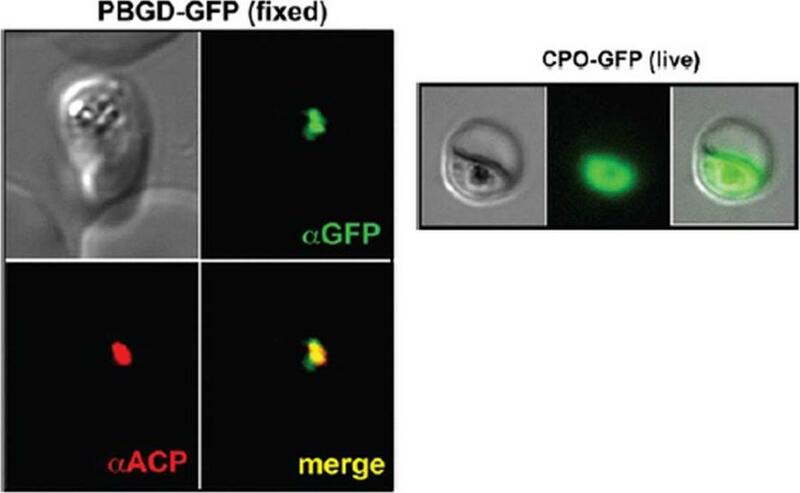 Fluorescence microscopy done on ACP-GFP expressing parasites indicates that ACP-GFP fusion protein (≈40 kDa) directed towards apicoplast has been imported and processed without much interference even after 6 hours post treatment.Cheemadan S, Ramadoss R, Bozdech Z. Role of Calcium Signaling in the Transcriptional Regulation of the Apicoplast Genome of Plasmodium falciparum. Biomed Res Int. 2014;2014:869401. 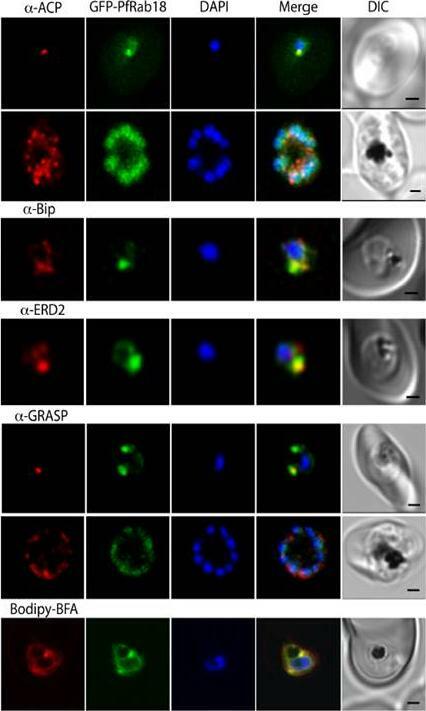 PfHAD1 is expressed in blood-stage parasites and is localized to the parasite cytoplasm. Immunofluorescence confocal microscopy of ACPLGFP trophozoite and schizont stained with a-GFP and a-PfHAD1 antibodies and Hoechst 33258 nuclear stain. Scale bars, 2 mm. PfHAD1 appears to be cytoplasmic and has minimal overlap with the apicoplast marker ACPL-GFP.Guggisberg AM, Park J, Edwards RL, Kelly ML, Hodge DM, Tolia NH, Odom AR. A sugar phosphatase regulates the methylerythritol phosphate (MEP) pathway in malaria parasites. Nat Commun. 2014 Jul 24;5:4467. Subcellular location, processing and genomic integration of helix stabilization. 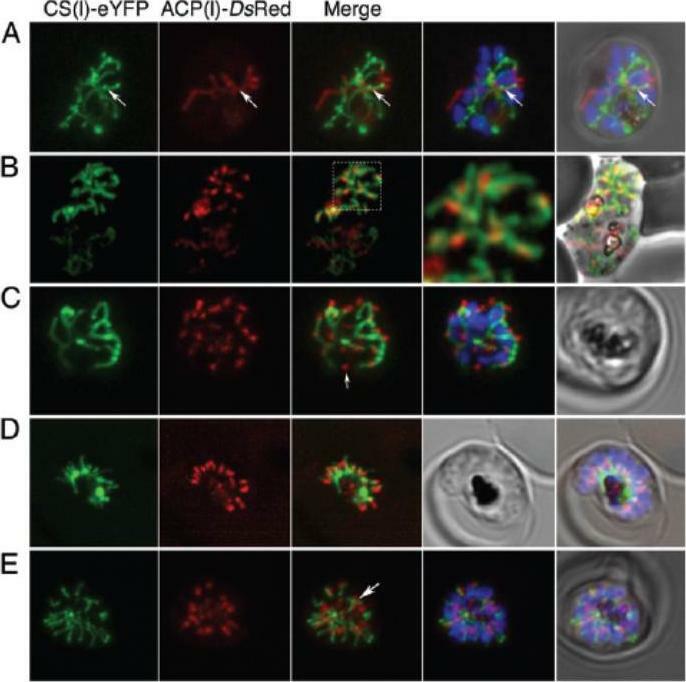 Constructs Epifluorescent images of live P. falciparum erythrocytic-stage parasites expressing GFP fused to helix stabilization mutants of the ACP leader peptide. The parasites were stained with mitotracker to identify mitochondria and DAPI to identify nuclei. Image z-stacks were deconvoluted and then presented as a single combined image. Scale bar = 2 μm. 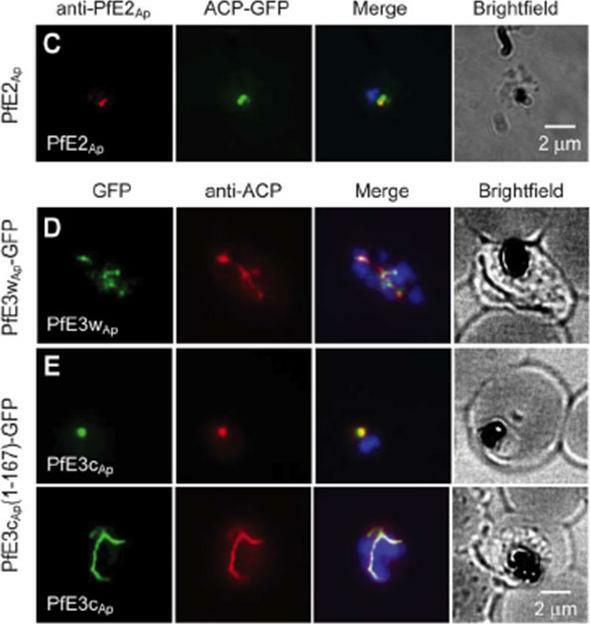 B) Colocalization of GFP constructs with endogenous ACP. 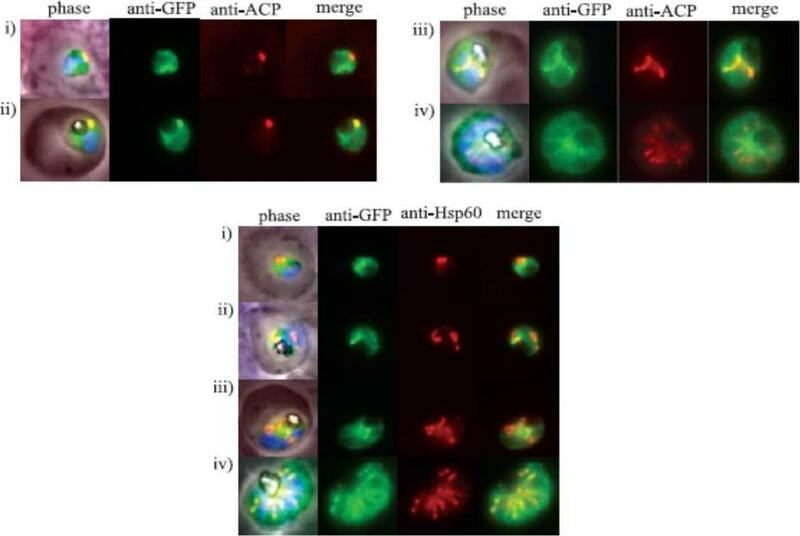 An antibody specific for GFP was found to colocalize with aACP antibodies, demonstrating apicoplast localization for all constructs except for a62. DAPI stains the nuclei. Scale bar = 2 μm. Any observed changes in localization are due to the stabilized helical structure, a single proline mutation was introduced into each of the engineered TPs at residue 30, producing the α31P and a62P constructs. The L30P mutation reduces the predicted average helical content for the a 31P and a62P constructs to 3% and 8%, respectively. 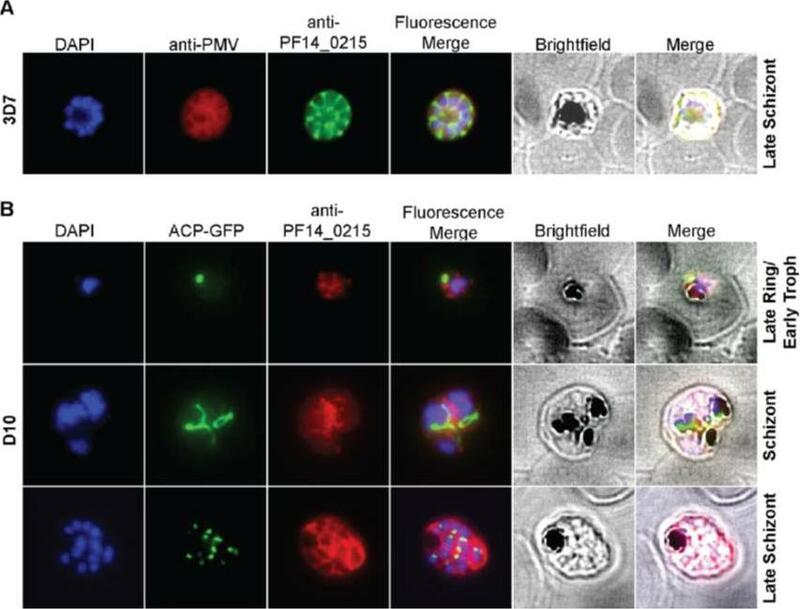 GFP fluorescence of the a62P constructs was observed around the periphery of the parasite, consistent with accumulation in the parasitophorous vacuole, as observed for the ΔT construct. the helix-stabilizing mutations in a62 prevented this construct from localizing to the apicoplast.Gallagher JR, Matthews KA, Prigge ST. Plasmodium falciparum apicoplast transit peptides are unstructured in vitro and during apicoplast import. Traffic. 2011 12(9):1124-38. 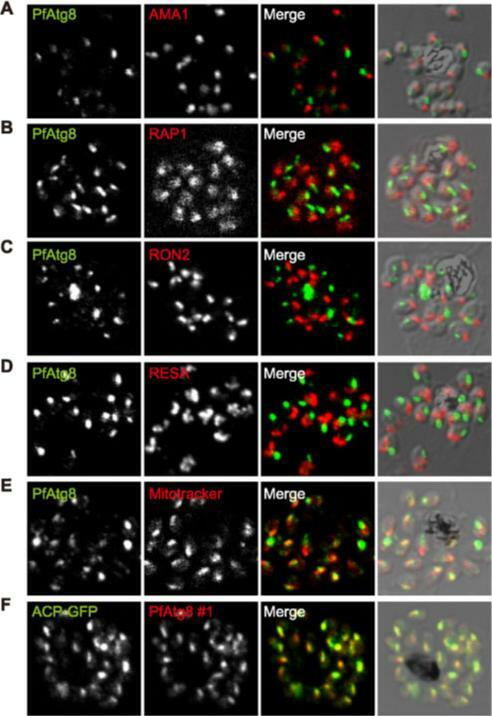 Colocalization of GFP constructs with endogenous ACP. αACP antibodies were affinity purified with the mature ACP domain to avoid cross-reactivity with the TP of ACP used in GFP fusions (26). GFP fluorescence was found to colocalize with αACP antibodies, demonstrating apicoplast localization. Scale bar = 2 μm. The 6PxxP mutation completely prohibits the formation of secondary structure in the TP. The 9PxxP construct disrupts secondary structure in the TP and the intervening region simultaneously without affecting protein localization. Substitution of 6 out of the 24 TP residues without perturbing trafficking to the apicoplast illustrates dramatic plasticity in TP recognition.Gallagher JR, Matthews KA, Prigge ST. Plasmodium falciparum apicoplast transit peptides are unstructured in vitro and during apicoplast import. Traffic. 2011 12(9):1124-38. Subcellular location of mutant proline constructs. Epifluorescent images of live P. falciparum erythrocytic-stage parasites expressing GFP fused to proline mutants of the ACP leader peptide. The parasites were stained with mitotracker to identify mitochondria and DAPI to identify nuclei. 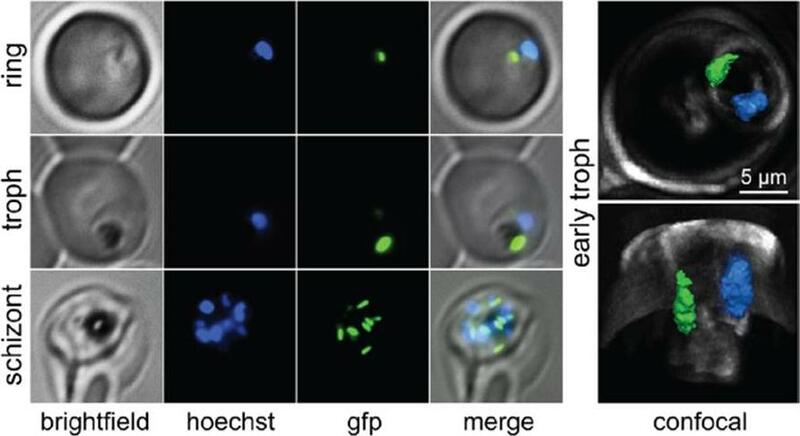 GFP fluorescence in the ΔT construct is associated with the parasite periphery and compartments in the erythrocyte cytosol. 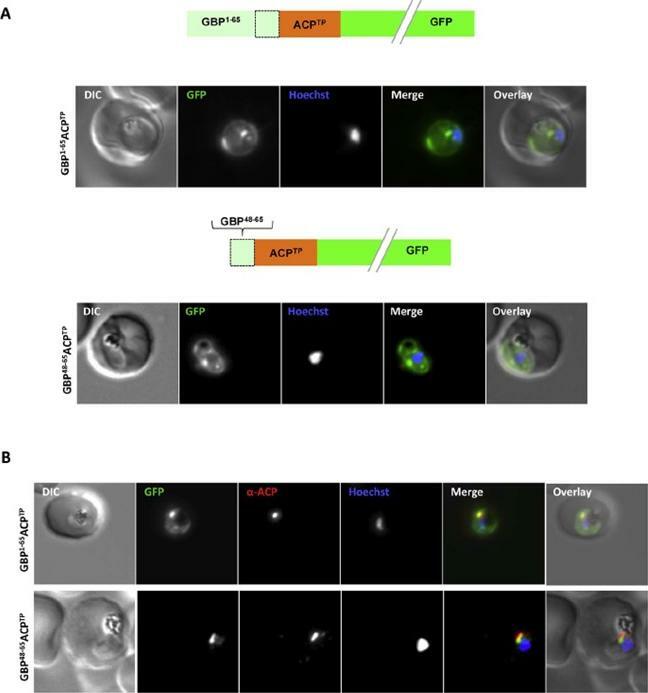 For the WT construct and all proline mutant TP constructs, ring and early trophozoite-stage parasites show point-like GFP fluorescence as expected for apicoplast localization. Late trophozoite-stage parasites show a branched structure labeled by GFP which is distinct from the mitochondria, consistent with apicoplast localization. Image z-stacks were deconvoluted and then presented as a single combined image. Scale bar = 2 μm.Gallagher JR, Matthews KA, Prigge ST. Plasmodium falciparum apicoplast transit peptides are unstructured in vitro and during apicoplast import. Traffic. 2011 Sep;12(9):1124-38. 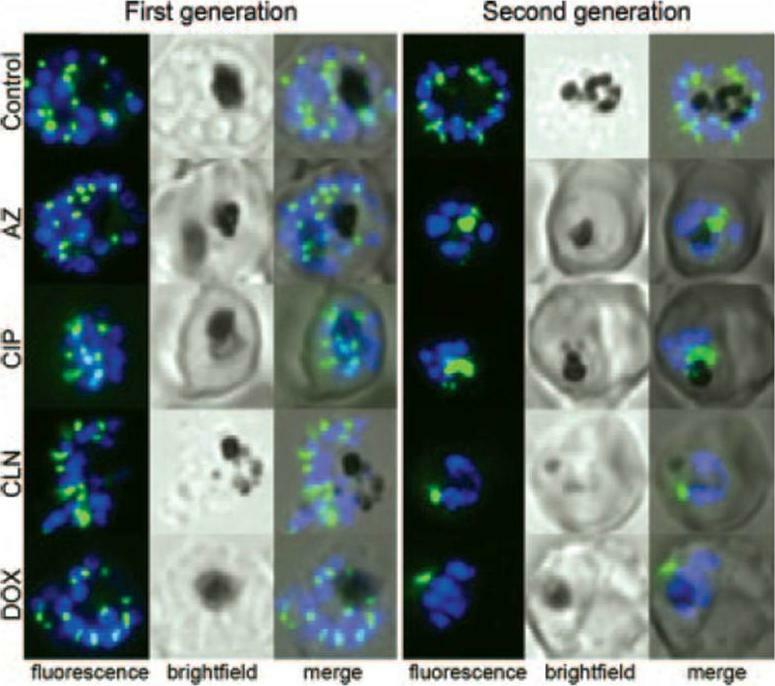 The distribution of PTS-GFP and apicoplast GFP during asexual maturation through late rings to the trophozoite stage. B, 18-h rings untreated (B, i and ii), or treated with 0.01% saponin (B, iii and iv). C, 36 h trophozoites untreated (C, i and ii), or treated with 0.01% saponin (C, iii and iv).Microscopic analysis of 18-h rings revealed green fluorescence primarily in the periphery of the parasite. Low levels of green fluorescence were also seen in association with apicoplast DNA (B, i and ii). When cells were treated with 0.01% saponin, there was loss of peripheral fluorescence. However, apicoplast-associated green fluorescence could be detected in the parasite (compare B, i and ii with iii and iv). In contrast in 36-h trophozoites, green fluorescence was prominently associated with the apicoplast (C, i and ii). This association was preserved even after treatment with 0.01% saponin (C, iii and iv). 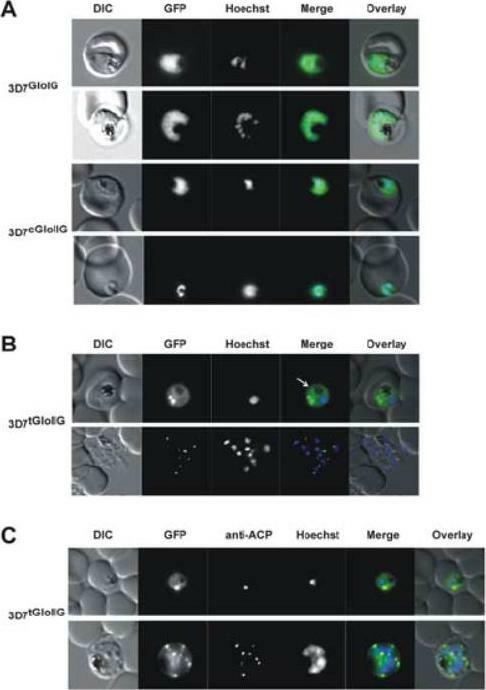 The bulk (70–80%) of PTS-GFP synthesized in the ring stages, transited through the PV prior to processing to GFP in the apicoplast at the trophozoite stage.Cheresh P, Harrison T, Fujioka H, Haldar K. Targeting the malarial plastid via the parasitophorous vacuole. J Biol Chem. 2002 277(18):16265-77. Stage-specific localization of apicoplast-targeted GFP and the effects of brefeldin A (bfa). 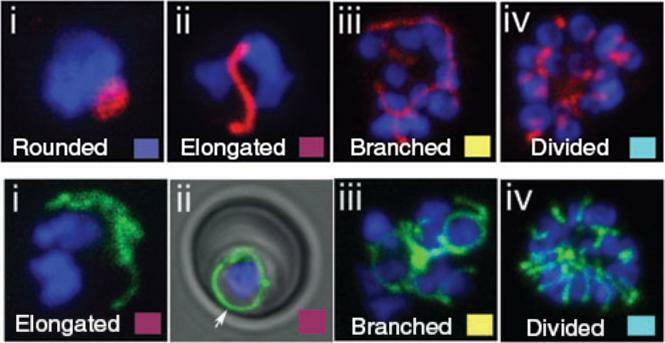 Distribution of green fluorescence and PfBiP (red) in a early-ring (A, i–iii) and a trophozoite (B, i–iii; a late, ~33 h, trophozoite with twonuclei stained in blue is shown). 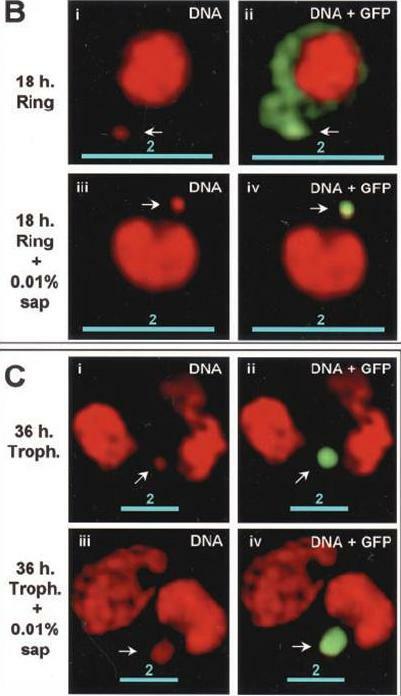 Distribution of green fluorescence and indicated secretory marker (red) in: rings incubated with Bfa for 24 h (C, i–iii); rings incubated with Bfa for 24 h, washed, and grown for 18 h in absence of drug (D, i–iii; E, i–iii); and trophozoites incubated with or without Bfa (F, i–iii). Blue indicates DNA stained with Hoechst 33342. White arrows in B, ii, D, ii, and E, ii, indicate apicoplast DNA. Scale bars as indicated in microns. PTS-GFP in rings did not show significant overlap with the resident ER marker PfBiP. Nonetheless, its tubular distribution suggested that it resided in one or more membranous compartments. 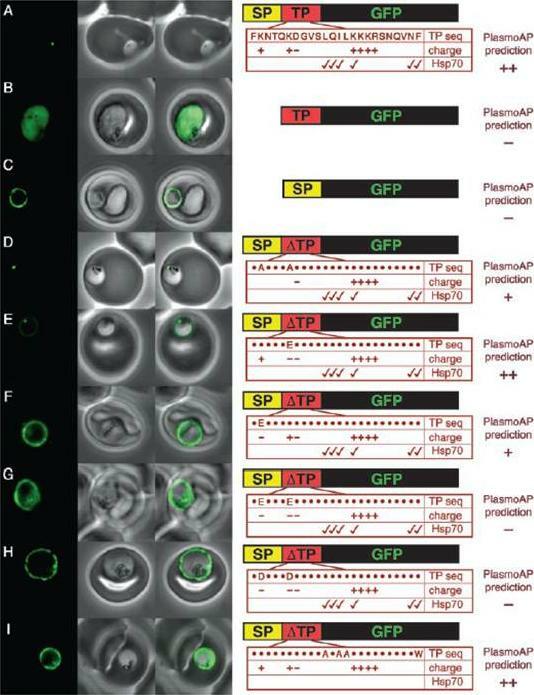 rings were allowed to mature in the presence of Bfa for 24 h (C, i–iii), the distribution of PTS-GFP as well as PfBiP (C, ii) were altered compared with either control rings or trophozoites shown in A and B. In the presence of Bfa, PfBiP lost its reticular staining and PTS-GFP accumulated in diffuse globular regions that show significant overlap with regions of PfBiP stain: however, PTS-GFP and BiP failed to show the identical distribution in Fig. 3C. 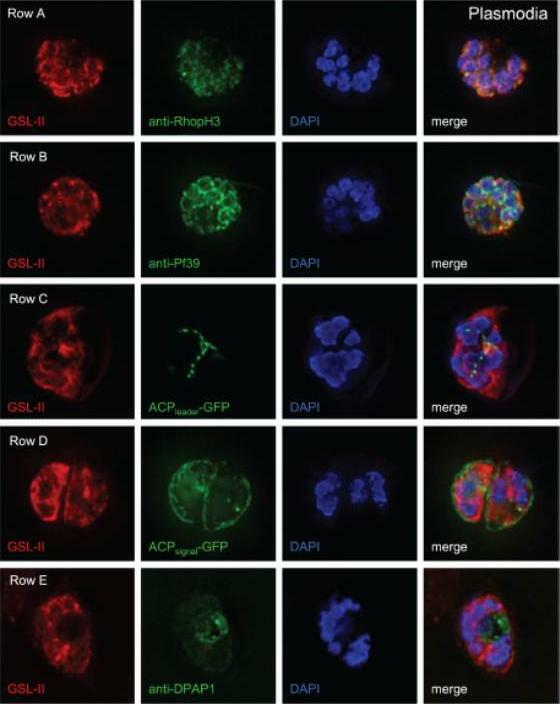 The Golgi marker PfERD2 was also reorganized by Bfa treatment, consistent with the action of the drug on blocking transport through the Golgi (C, iii).Cheresh P, Harrison T, Fujioka H, Haldar K. Targeting the malarial plastid via the parasitophorous vacuole. J Biol Chem. 2002 277(18):16265-77. Localization of PfMRScyt using antibodies directed against the N-terminal domain. The protein localizes in the cytoplasm for all asexual parasite stages. (D) Localization ofMRSapi, studied using antibodies against the anticodon binding domain. 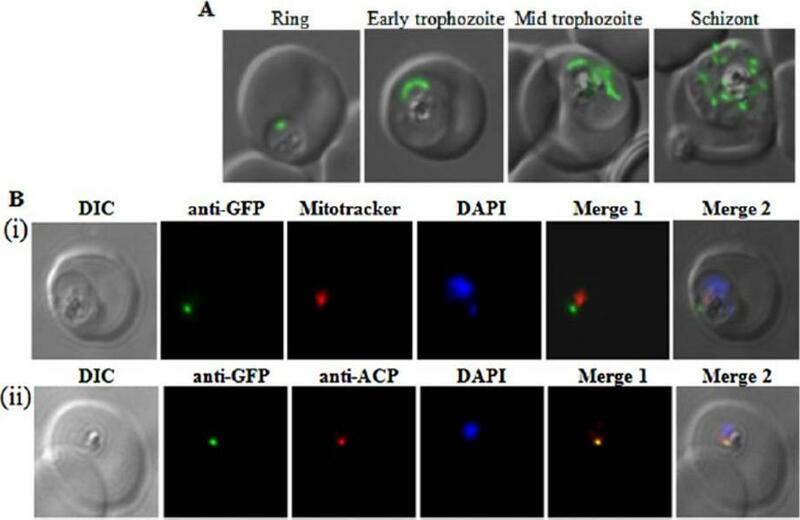 Localization of MRSapi in apicoplasts in three asexual stages (ring, trophozoite, and schizont) was verified.Hussain T, Yogavel M, Sharma A. Inhibition of protein synthesis and malaria parasite development by drug targeting of methionyl-tRNA synthetases. Antimicrob Agents Chemother. 2015 Apr;59(4):1856-67. Characterization of the lysylation system in P. falciparum. Immunofluorescence assays of infected red blood cells (iRBCs) containing PfKRS-2leader-GFP-transfected P. falciparum parasites. The GFP-tagged sequence colocalizes with ACP and not with Mitotracker, indicating that it is being specifically targeted to the apicoplast, consistently with the bioinformatic predictions. Hoen R, Novoa EM, López A, Camacho N, Cubells L, Vieira P, Santos M, Marin-Garcia P, Bautista JM, Cortés A, Ribas de Pouplana L, Royo M. Selective inhibition of an apicoplastic aminoacyl-tRNA synthetase from Plasmodium falciparum. Chembiochem. 2013 14(4):499-509. Apicoplasts distribute normally into the progeny of antibiotic-treated parasites but are abnormal in the following cycle. ACPl-GFP 3D7 strain transgenic parasites were treated with antibiotics at twice the IC50 at 96 h (100 nM azithromycin [AZ], 6 mM ciprofloxacin [CIP], 25 nM clindamycin [CLN], and 1 mM doxycycline [DOX]), and representative live parasites were imaged by fluorescence microscopy. GFP-labeled apicoplasts are green; Hoechst-stained nuclei are blue.Dahl EL, Rosenthal PJ. Multiple antibiotics exert delayed effects against the Plasmodium falciparum apicoplast. Antimicrob Agents Chemother. 2007 51(10):3485-90. GFP targeting by mutant ACP transit peptides. (A) Apicoplast targeting of the wild-type ACP leader. (B) Cytosolic targeting of a construct lacking a signal peptide. (C) Secretion to the parasitophorous vacuole of a construct lacking a transit peptide. The substitutions introduced into mutants (D to I) are detailed in the accompanying panels at right (25), where a dot ( ) indicates no change. Check marks indicate putative Hsp70 binding sites. 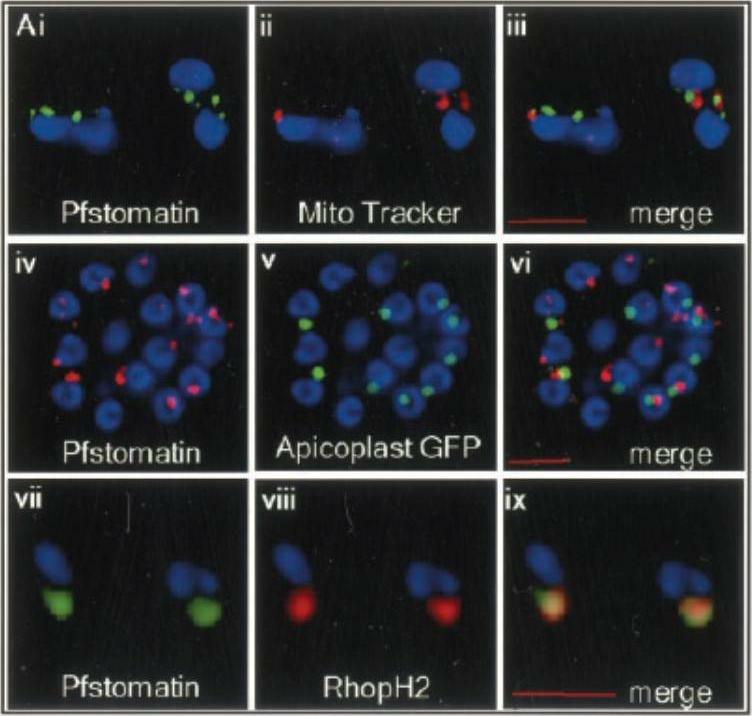 Predictions by the apicoplast protein predictor PlasmoAP are shown for each mutant. 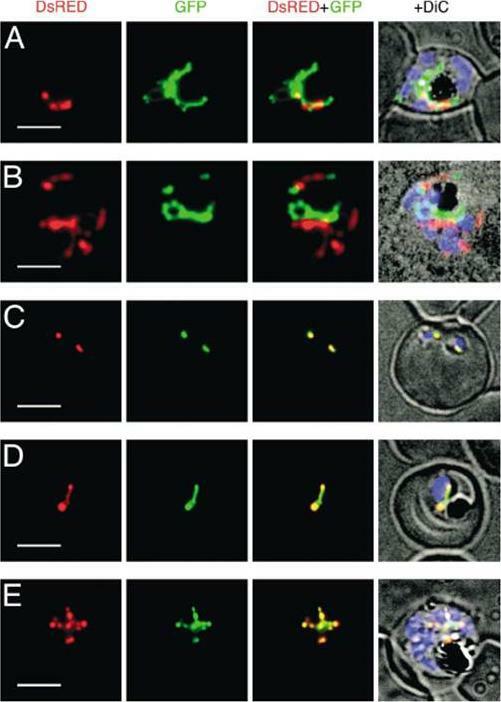 Internal labeling in (F) to (I) likely represents GFP in the food vacuole that has been taken up from the parasitophorous vacuole during phagocytosis.Foth BJ, Ralph SA, Tonkin CJ, Struck NS, Fraunholz M, Roos DS, Cowman AF, McFadden GI. Dissecting apicoplast targeting in the malaria parasite Plasmodium falciparum. Science. 2003 299(5607):705-8. Two upper panels: Localisation of PfFtsH1 in a P. falciparum 3D7 transfectant line carrying C-terminal 3xHA-tagged PfFtsH1. (B) Immunofluorescence localization of PfFtsH1-HA using the anti-HA mAb and antibody against the apicoplast marker ACP. No overlap of PfFtsH1-HA signal was observed with the apicoplast marker. (C) PfFtsH1 co-localizes with the mitochondrial signal in trophozoites (upper panel) and appears as punctuate signals lining the organelle defined by the mitochondrial stain Mitotracker Red in schizonts (lower panel). (D) Confocal microscopy PfFtsH1-HA expressing parasites showing co-localisation of PfFtsH1 with the mitochondrion which is stained with Mitotracker Red.Lower panel: Localization of PfFtsH1 to the mitochondrion is confirmed by immunofluorescence with anti-FtsH1 Ab. Confocal immunofluorescence microscopy of P. falciparum 3D7 infected erythrocytes using Mitotracker Red and anti-FtsH1 Ab shows localization of PfFtsH1 in the parasite mitochondrion.Tanveer A, Allen SM, Jackson KE, Charan M, Ralph SA, Habib S. An FtsH protease is recruited to the mitochondrion of Plasmodium falciparum. PLoS One. 2013 8(9):e74408. IFM images of fixed 3D7 parasites expressing full-length ALAD tagged at its endogenous locus with C-terminal GFP confirm targeting to the parasite apicoplast.Parasites were stained with αGFP and αACP (ACP, apicoplast marker).Sigala PA, Crowley JR, Henderson JP, Goldberg DE. Deconvoluting heme biosynthesis to target blood-stage malaria parasites. Elife. 2015 Jul 14;4. Loss of apicoplast in indolmycin-treated, IPP-rescued parasites. Live cell fluorescence comparing treated and untreated ACP-DsRed/CS-eYFP P. falciparum 3D7. ACP, apicoplast acyl-carrier protein. DIC, differential interference contrast. CS, mitochondrial citrate synthase. Pasaje CF, Cheung V, Kennedy K, Lim EE, Baell JB, Griffin MD, Ralph SA. 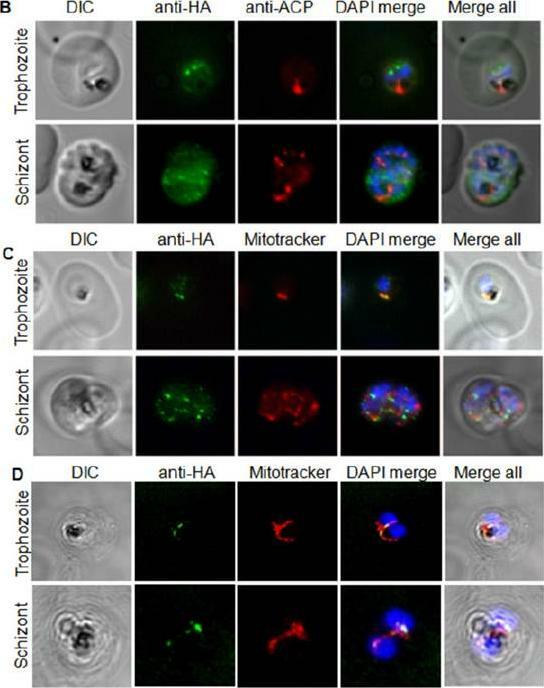 Selective inhibition of apicoplast tryptophanyl-tRNA synthetase causes delayed death in Plasmodium falciparum. Sci Rep. 2016 6:27531. Dual localization of PfAOP. (A) Immunofluorescence localization of PfAOP in blood stage parasites. (C) Co-localization analysis of PfAOP and a chimera of acyl-carrier protein and GFP (ACP-GFP) as an apicoplast-localized marker protein. Left, upper panel: a rather strong fluorescence was detected in the parasite cytosol. Left: Cytosolic or apicoplast localization of mutated and truncated GFP-tagged PfAOP. Additional confocal live cell images of blood stage parasites expressing the indicated PfAOP-GFP chimera. 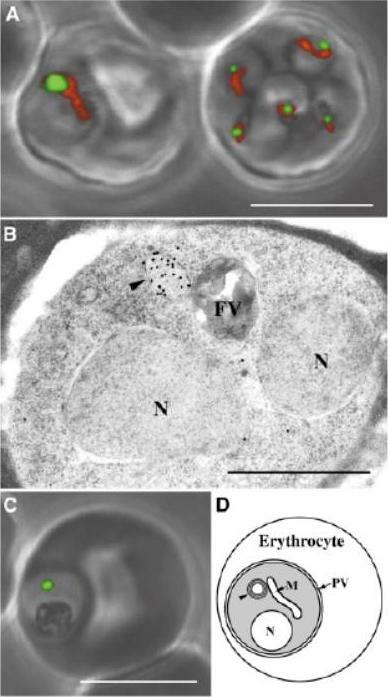 Early trophozoite to late schizont stage parasites are shown from top to bottom for each construct. Scale bar, 5 μm. Unprocessed full length PfAOP was not observed.Djuika CF, Huerta-Cepas J, Przyborski JM, Deil S, Sanchez CP, Doerks T, Bork P, Lanzer M, Deponte M. Prokaryotic ancestry and gene fusion of a dual localized peroxiredoxin in malaria parasites. Microb Cell. 2015 2(1):5-13. 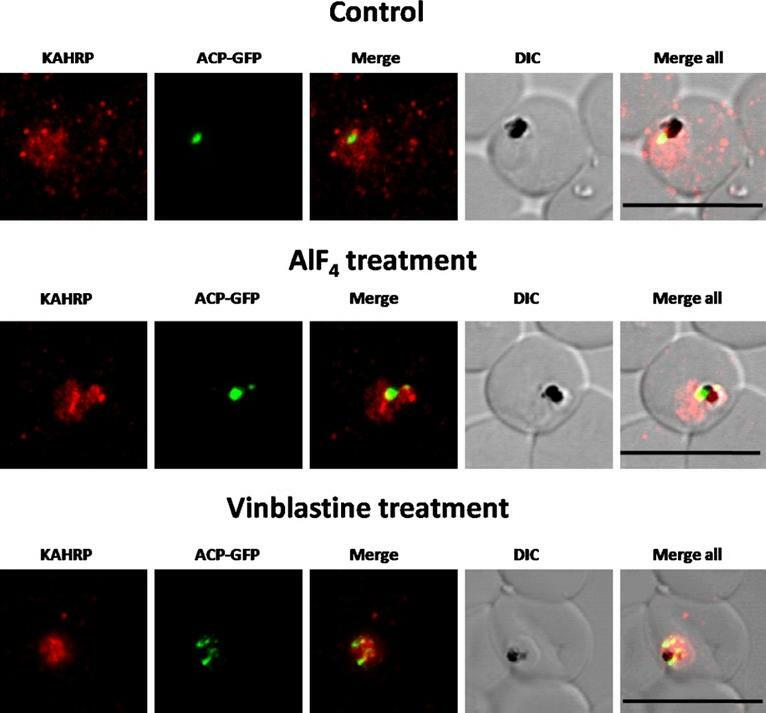 Immunofluorescence images showing PfKAHRP trafficking in control, AlF4−-treated and vinblastine treated D10-ACPleader-GFP parasites In AlF4− treatment, KAHRP trafficking to the RBC cytosol and surface was inhibited in 97% of the parasites 87 parasites analyzed. In vinblastine treated cultures, KAHRP trafficking to the RBC cytosol and surface was inhibited in 98% of the 56 parasites analyzed (See Table S2 for quantification). Scale Bar: 10 µm.Chaudhari R, Dey V, Narayan A, Sharma S, Patankar S. Membrane and luminal proteins reach the apicoplast by different trafficking pathways in the malaria parasite Plasmodium falciparum. PeerJ. 2017 Apr 27;5:e3128. 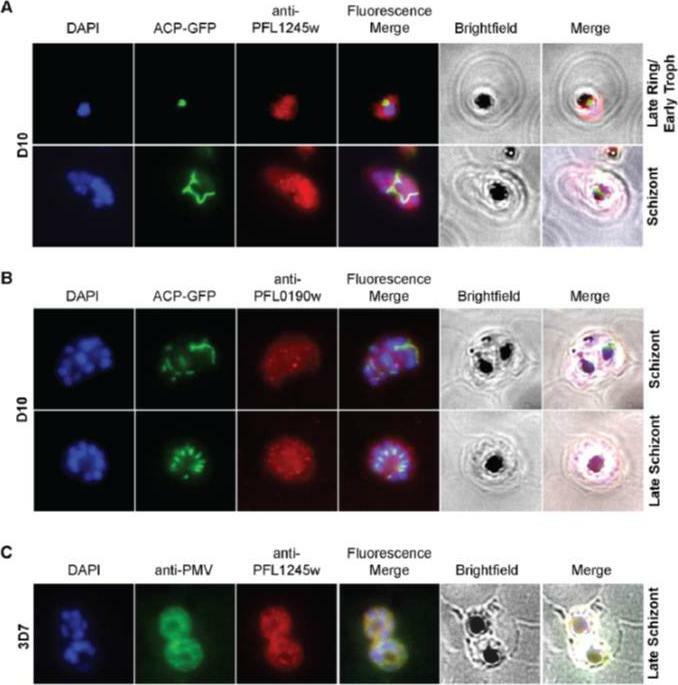 PfTPxGl localization to the outermost membrane of the apicoplast in D10-ACPleader-GFP parasites. (C) Localization of PfTPxGl to the membranes of intact/permeabilized apicoplasts from control parasites, (D) Absence of PfTPxGl in the membranes of intact/permeabilized apicoplasts from AlF4- treated parasites. Scale Bars as indicated in the figures. anti-GFP antibodies stained the apicoplast lumen (red signal) only in the permeabilized organelles, but not in the intact ones (C). This immunofluorescence signal colocalized with the intrinsic GFP fluorescence (green signal) of ACP-GFP. In both fractions, anti-PfTPxGl antibodies clearly showed staining surrounding the fluorescent signals from luminal ACP-GFP. While the size and morphology of free intact apicoplasts (based on ACP-GFP staining) remained unaltered, no peri-organellar PfTPxGl signal was observed in the immunofluorescence analysis of intact as well as permeabilized organelles, indicating the involvement of vesicles in the membrane targeting of this protein (D).Chaudhari R, Dey V, Narayan A, Sharma S, Patankar S. Membrane and luminal proteins reach the apicoplast by different trafficking pathways in the malaria parasite Plasmodium falciparum. PeerJ. 2017 Apr 27;5:e3128. Immunofluorescence images show PfTPxGl, microtubules, ACP-GFP, PfACP and PfEMP1 trafficking in AlF4-treated D10-ACPleader-GFP parasites. 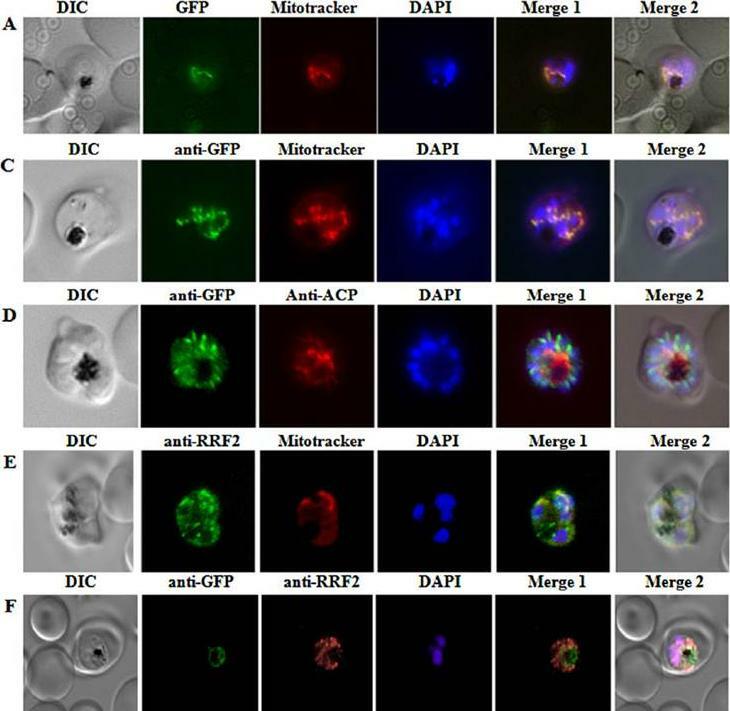 (A) PfTPxGl, ACP-GFP, PfACP and PfEMP1 localization in control parasites, (B) PfTPxGl, ACP-GFP, PfACP and PfEMP1 localization in AlF4-treated parasites. For D10-ACPleader-GFP parasites, 98% of the 115 parasites analyzed showed disrupted PfTPxGl signal while 96% of the 147 parasites analyzed showed arrest of PfEMP1 in the parasites. Scale Bar: 10 mm. 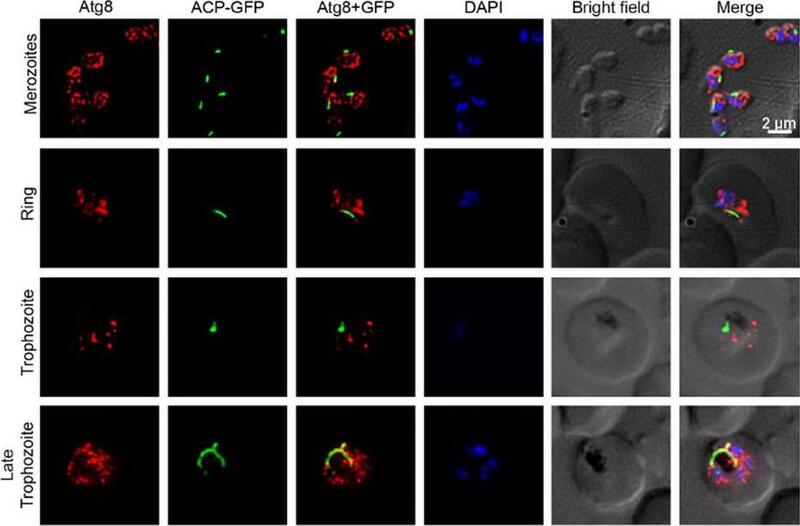 In control as well as in treated parasites, endogenous ACP colocalized perfectly with ACP-GFP signal suggesting that it was unaltered by the treatment. 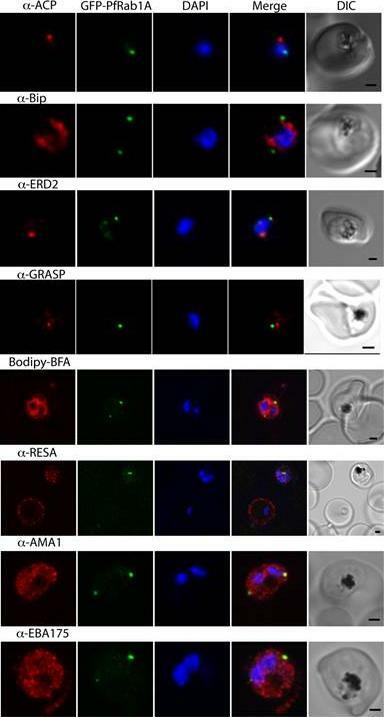 PfEMP1 was found both in the parasite and in punctate structures in the host RBC.Chaudhari R, Dey V, Narayan A, Sharma S, Patankar S. Membrane and luminal proteins reach the apicoplast by different trafficking pathways in the malaria parasite Plasmodium falciparum. PeerJ. 2017 Apr 27;5:e3128. Immunofluorescence images showing PfTPxGl and microtubules in D10-ACPleader-GFP parasites with drug washed out. 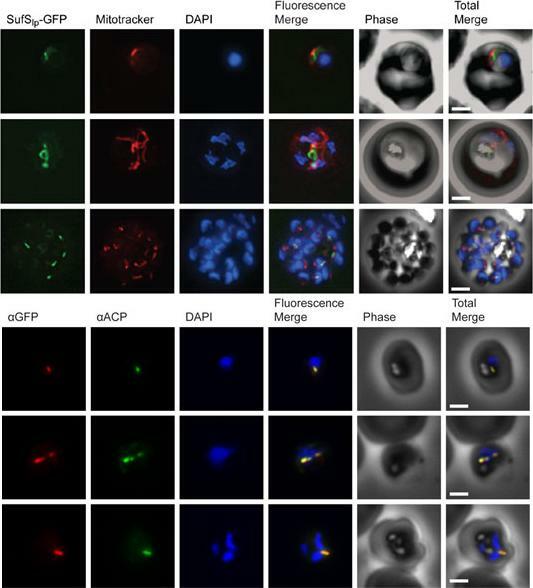 Reversion of PfTPxGl localization to the organelles and intact microtubular structures observed in parasites in drug washed out medium after vinblastine treatment. 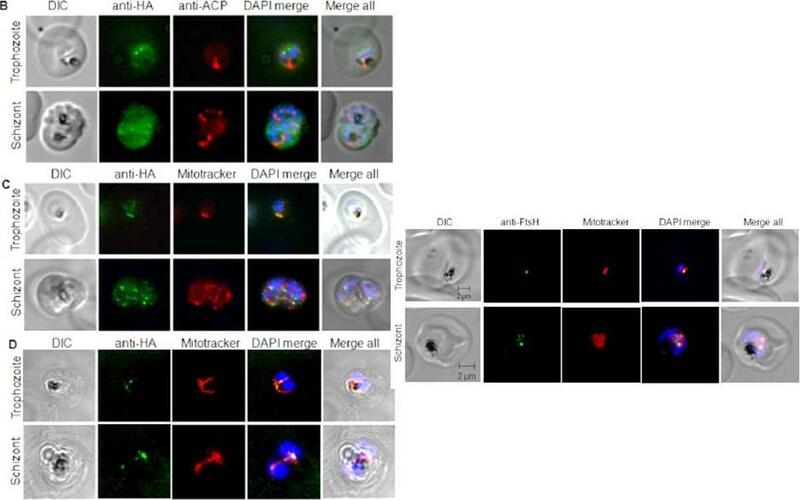 In these experiments, localization of PfTPxGl was reverted to the apicoplast in 47% parasites, while remaining 53% parasites showed mitochondrial localization (23 parasites counted). Scale Bar: 10 mm.Chaudhari R, Dey V, Narayan A, Sharma S, Patankar S. Membrane and luminal proteins reach the apicoplast by different trafficking pathways in the malaria parasite Plasmodium falciparum. PeerJ. 2017 Apr 27;5:e3128. Immunofluorescence images show PfTPxGl, microtubules, ACP-GFP, PfACP and PfEMP1 trafficking in vinblastine-treated D10-ACPleader-GFP parasites. 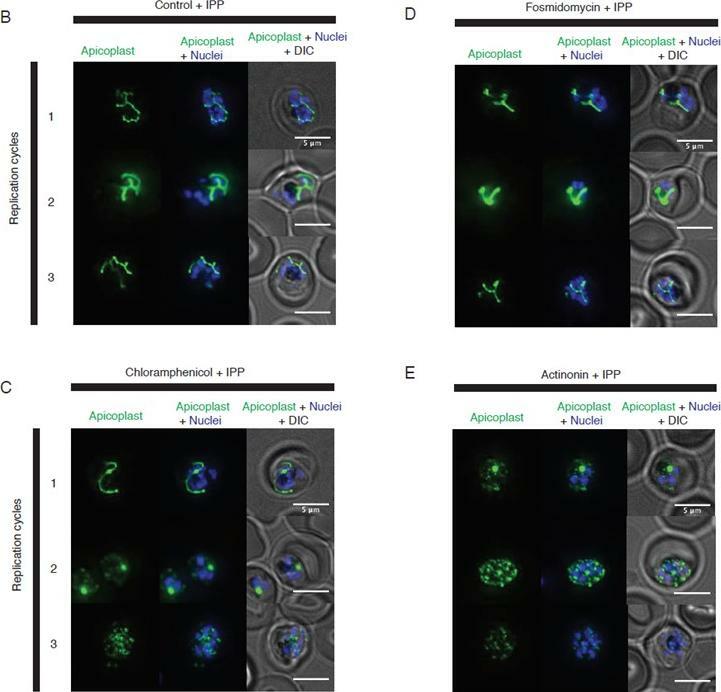 (A) PfTPxGl, microtubules, ACP-GFP, PfACP and PfEMP1 localization in solvent control parasites, (B) PfTPxGl, microtubules, ACP-GFP, PfACP and PfEMP1 localization in vinblastine treated parasites. In these experiments, targeting to the apicoplast was inhibited in 94% of the parasites with vinblastine treatment (33 parasites counted) while an arrest of PfEMP1 was observed in 97% of the parasites (134 parasites counted). Scale Bar: 10 mm.Chaudhari R, Dey V, Narayan A, Sharma S, Patankar S. Membrane and luminal proteins reach the apicoplast by different trafficking pathways in the malaria parasite Plasmodium falciparum. PeerJ. 2017 Apr 27;5:e3128. Actinonin inhibits apicoplast biogenesis in P. falciparum. Representative images of the apicoplast of IPP-rescued control and actinonin treated parasites 24 hours after treatment during the schizont stage. The apicoplast is visualized using the P. falciparum reporter strain D10 ACP-GFP in which GFP is targeted to the apicoplast and the nucleus is stained with Hoescht 33342. 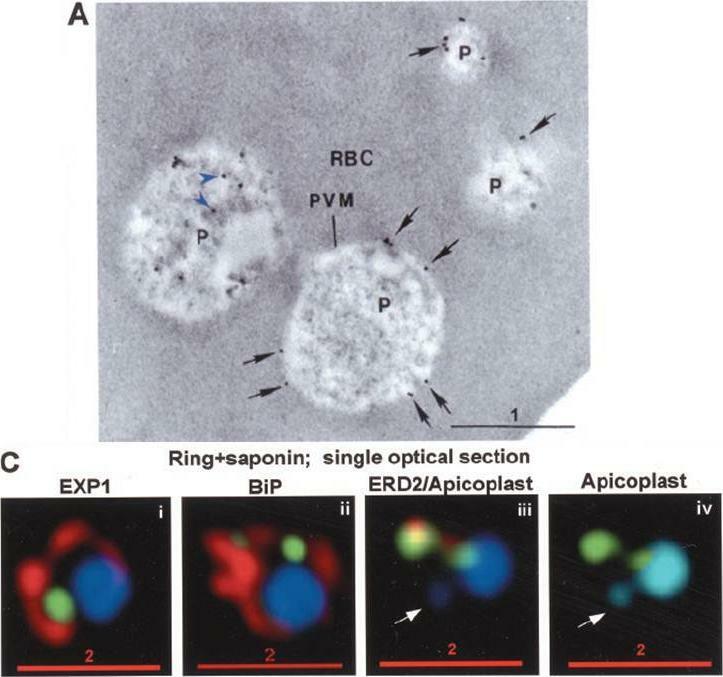 During Plasmodium replication, the apicoplast starts as a single small spherical organelle (ring stage) which branches and divides into multiple apicoplasts (schizont stage). A punctate apicoplast that does not branch indicates a defect in apicoplast biogenesis.Amberg-Johnson K, Hari SB, Ganesan SM, Lorenzi HA, Sauer RT, Niles JC, Yeh E. Small molecule inhibition of apicomplexan FtsH1 disrupts plastid biogenesis in human pathogens. Elife. 2017 Aug 18;6. pii: e29865. Representative images of the apicoplast during schizont stage of three successive replication cycles in untreated (b), chloramphenicol (c), fosmidomycin (d) and actinonin (e) treated cultures all grown with IPP. The apicoplast is visualized using the P. falciparum reporter strain D10 ACP-GFP in which GFP is targeted to the apicoplast and the nucleus is stained with Hoescht 33342. In this case, a branched apicoplast indicates successful apicoplast development while punctate apicoplasts (observed in replication cycle 1 for actinonin treatment (e) and replication cycle 2 for chloramphenicol treatment (c)) represents an apicoplast that has failed to develop. The apicoplast is no longer present after replication cycle 2 of actinonin treatment and upon replication cycle 3 of chloramphenicol treatment, which leads to complete mislocalization of the GFP.Amberg-Johnson K, Hari SB, Ganesan SM, Lorenzi HA, Sauer RT, Niles JC, Yeh E. Small molecule inhibition of apicomplexan FtsH1 disrupts plastid biogenesis in human pathogens. Elife. 2017 Aug 18;6. pii: e29865.